It’s going to be another hot day and for the umpteenth time I scold myself for not rising above my aversion to shopping, to go and buy some lighter walking boots…….next week maybe. 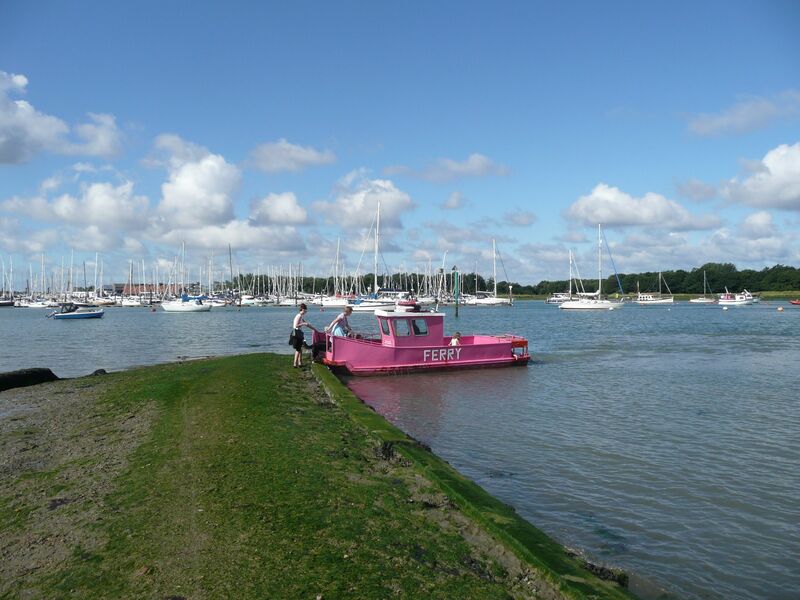 Following directions I head for the small bright pink building on the shoreline which is the shelter for the Hamble ferry. In front of me is a young girl, a little wobbly on her high heels on the cracked concrete, and a woman of my age shooing along two small children and a beautiful but very nervous sheep dog. 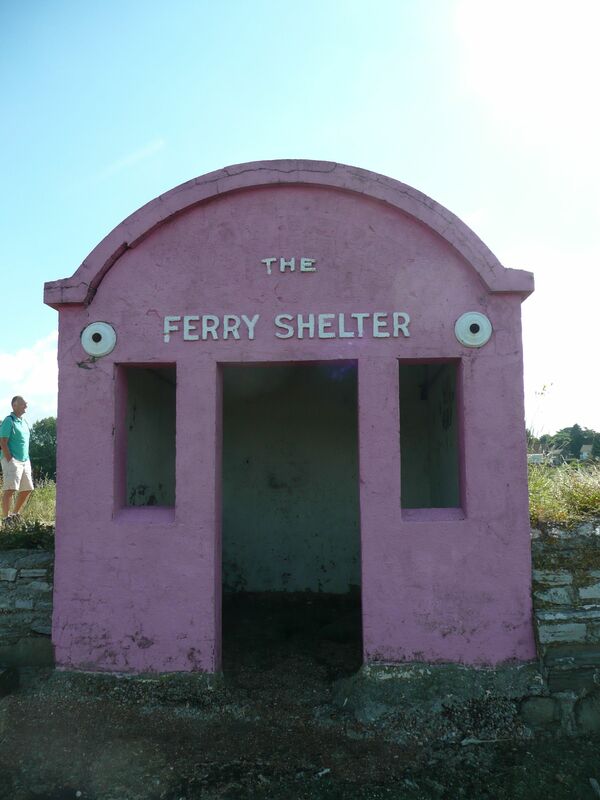 We all pile in to the very small pink ferry and chug our way across to the other side. The dog, she tells me is a stray rescued by an animal charity and that when she applied to get a dog she was not allowed to see any pictures, only a description……she was very lucky with this one. 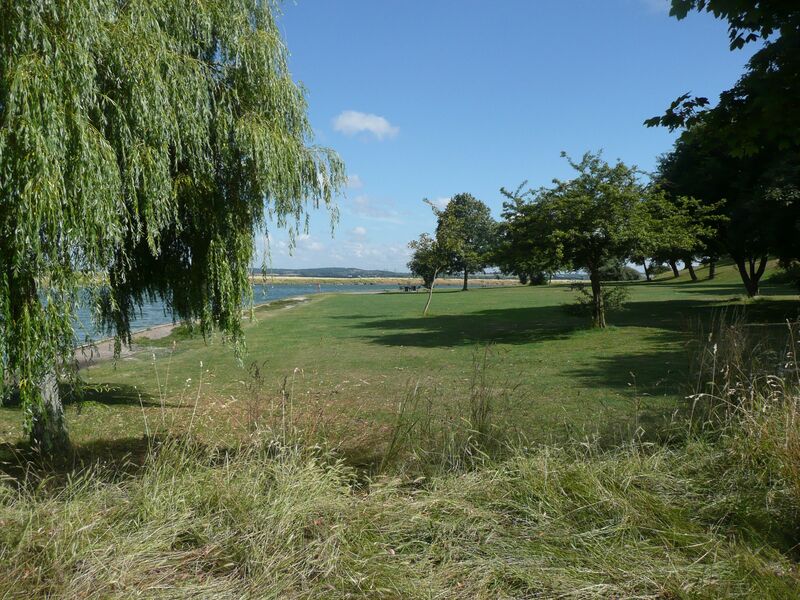 On the other side, in Hamble-le Rice, a marina blocks the path, so I turn up a street, meander around some parkland and then spy my entrance to Hamble Common. 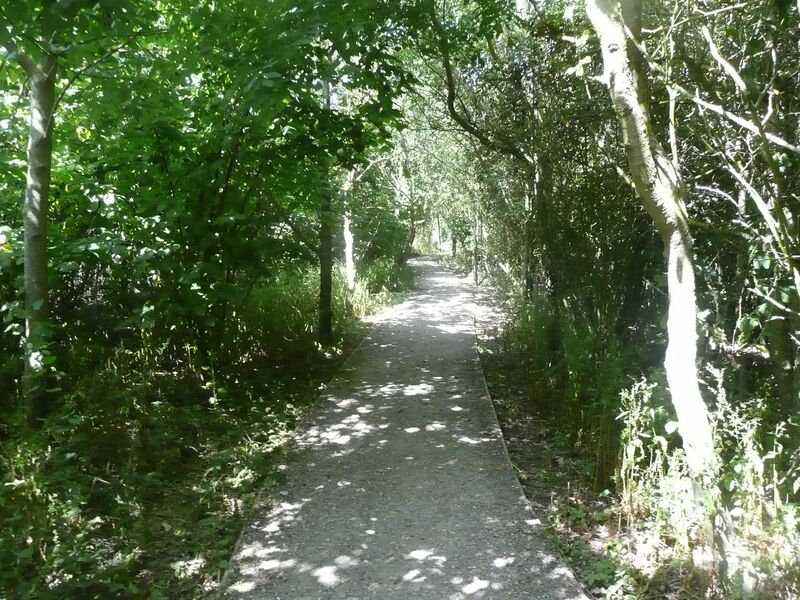 I now find myself on a shady woodland path which then opens out to green scrub and ponds. 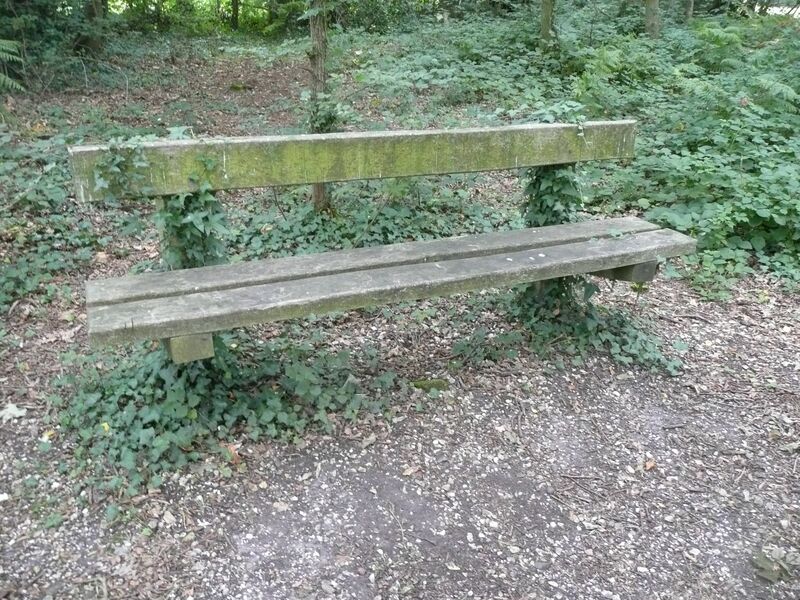 At one point a sculpture surprises me and an overgrown bench sets me thinking as to how long it would take for the ivy to smother it completely…………………yes I know. Coming back to the shore I walk past an anti-aircraft weapon that was apparently used to protect the BP fuel terminal and extremely long jetty just ahead of me. 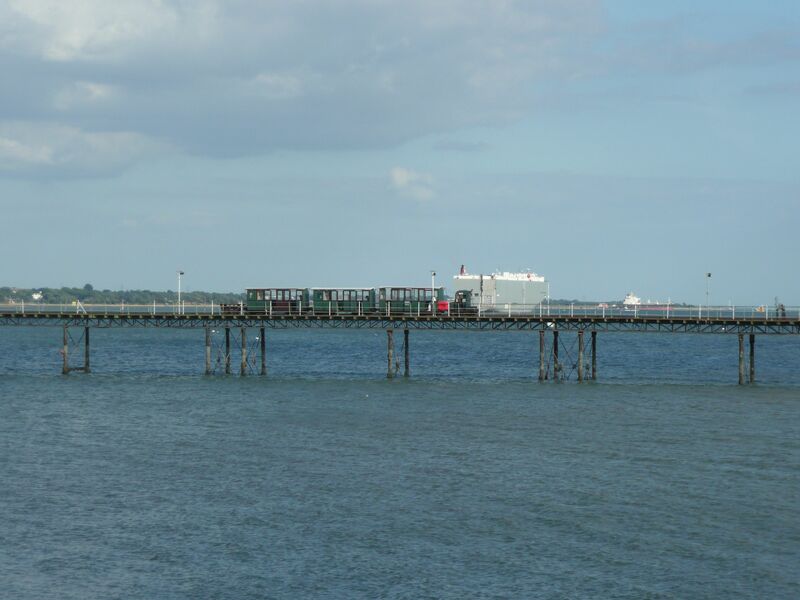 Oil from the Fawley refinery across the water was pumped here through an underwater pipeline and then taken by ship to Sandown on the Isle of Wight. From here pipes were laid under the Channel to supply allied forces during the invasion of Europe. This was known as the PLUTO operation and what really caught my attention was that the pumping stations here in Britain were often camouflaged as private houses, offices and ice-cream kiosks! So…….for reasons I won’t go into here, when I reach the oil refinery I decide to head inland and after twenty minutes of road walking I see a sign for the Flying Boat Cafe, which at the time I thought was an odd name…….all was to be revealed later on. Heading back towards the shore I join the Solent Way again on a clear path beside Southampton Water, running parallel to the shingle beach. Across the water I can see Fawley Oil Refinery and as I walk I see evidence of people ignoring the signs prohibiting fires. 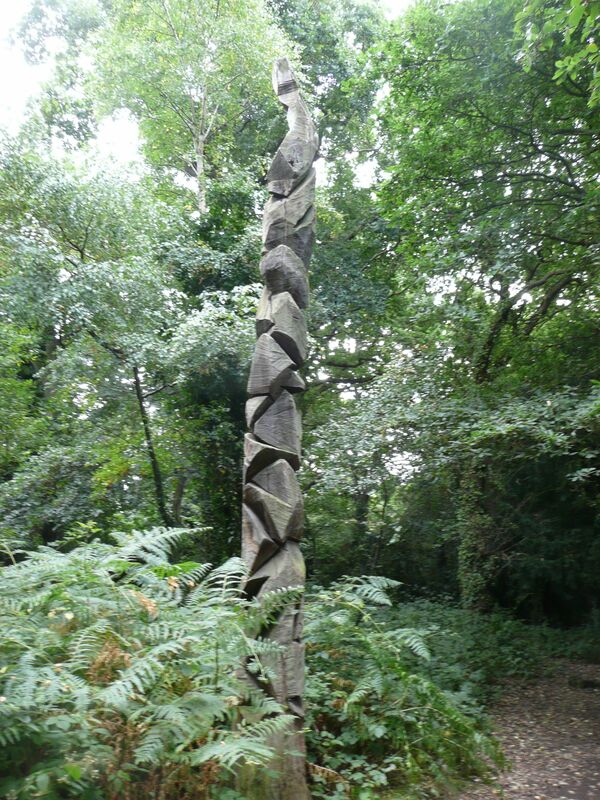 Eventually, more and more people come into view and the path opens up into a landscaped country park with some magnificent trees, that I later discover are Monterey Cypresses. 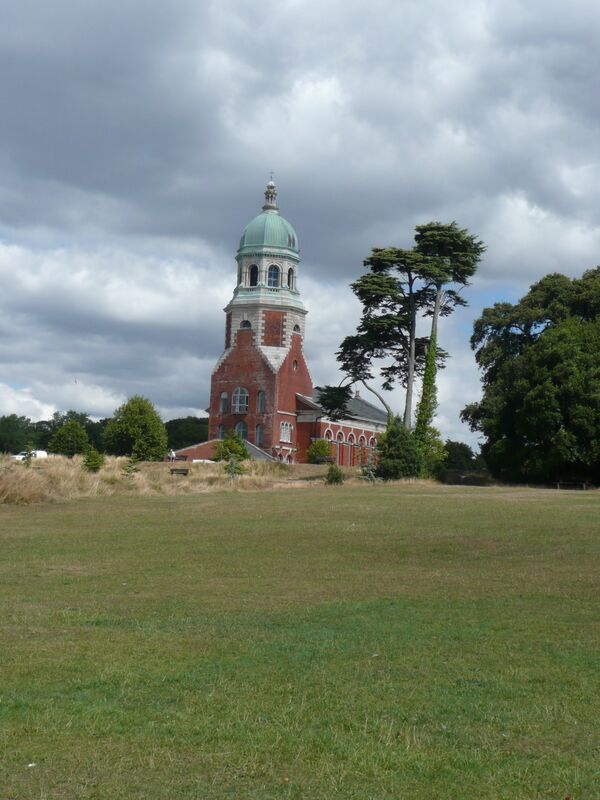 This is Victoria Country Park and the building in the photo is the chapel of the now demolished military hospital. 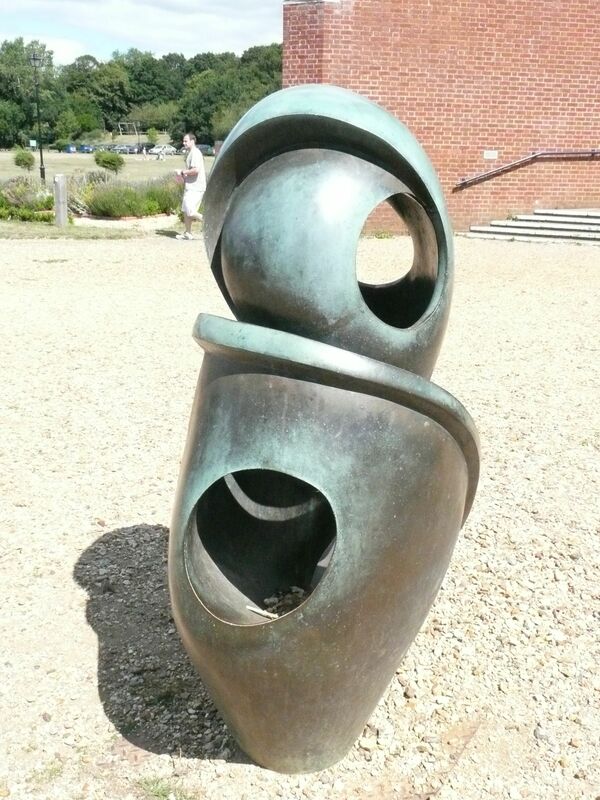 At the entrance is a sculpture into which someone has dumped litter and plastic bottles. Feeling virtuous I take the litter into the entrance hallway and ask for a dustbin – a lady in a twin set and pearls, somewhat begrudgingly takes the bottles from me with a strained smile. Walking out of the park I read that Queen Victoria and Prince Albert laid the foundation stone for the hospital – it weighed 2 tons and was hewn from Welsh granite. My way is now barred by yet another marina so I walk up into the village of Netley and eventually find a turning off left back to the Solent Way. 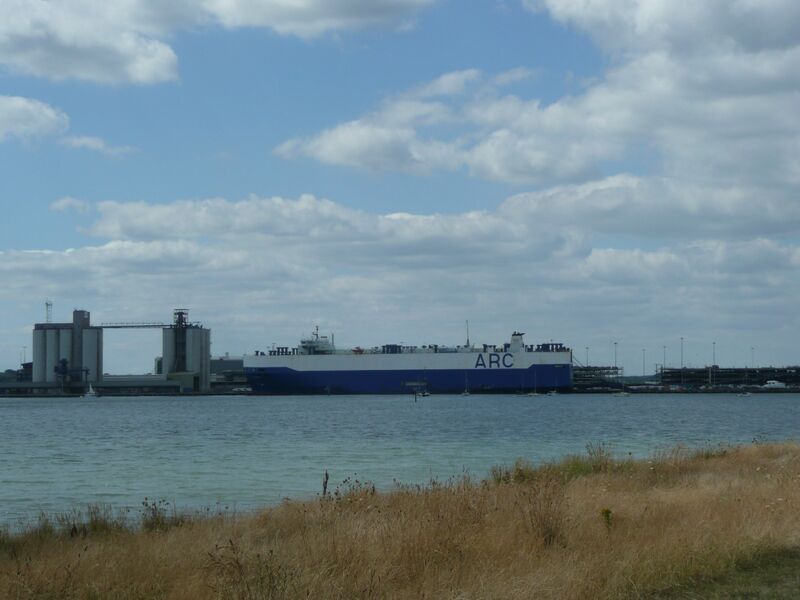 This is a lovely walk, a clear path alongside glittering blue water, while up ahead I can see the indistinct shapes of large container ships in Southampton Docks. 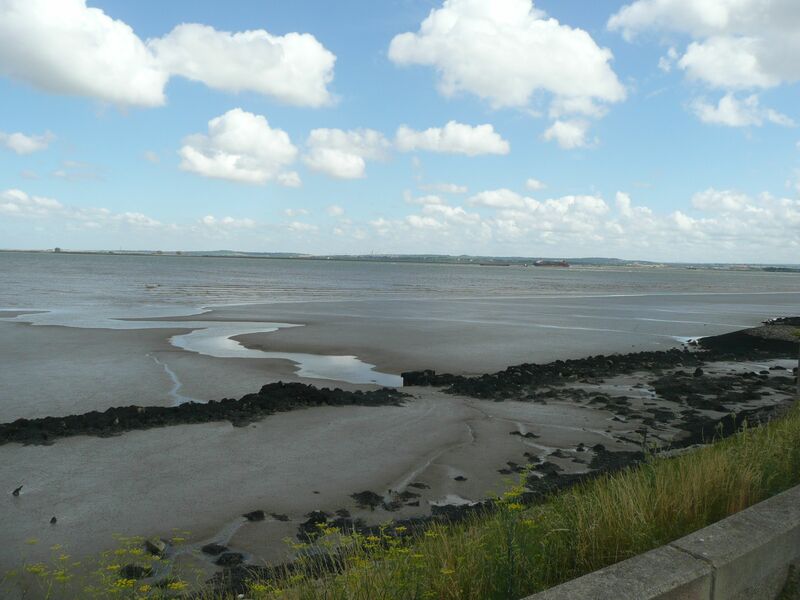 Soon I am walking towards the outskirts of Southampton, an area known as the Weston Shore, a popular beach destination for city dwellers in the 50’s. Today it feels a little abandoned – four east block skyscrapers strangely painted baby blue occupy a large area of wasteland, a few children play furtively in the bus shelters. 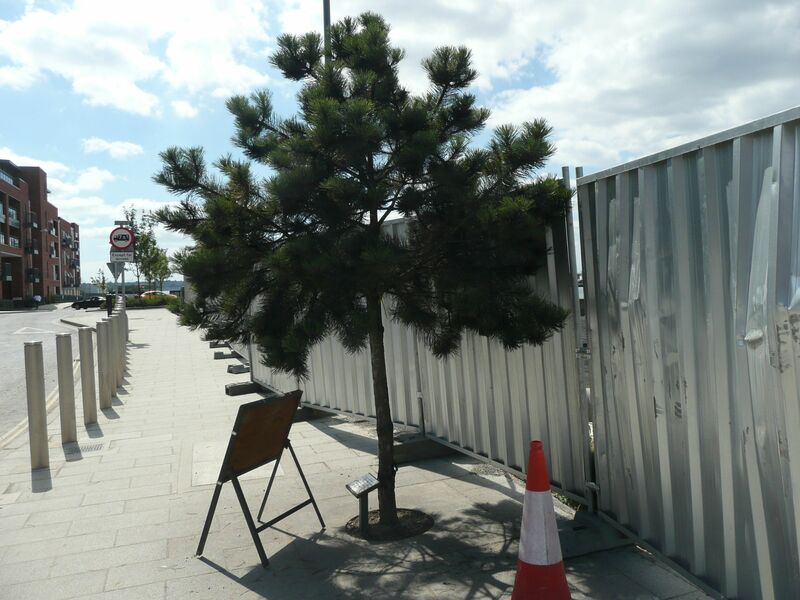 And then it’s downhill from here, past run down houses and grubby shops, massive building sites slamming up “luxury” dockside apartment blocks, a tree, planted for the Millennium, is spared. 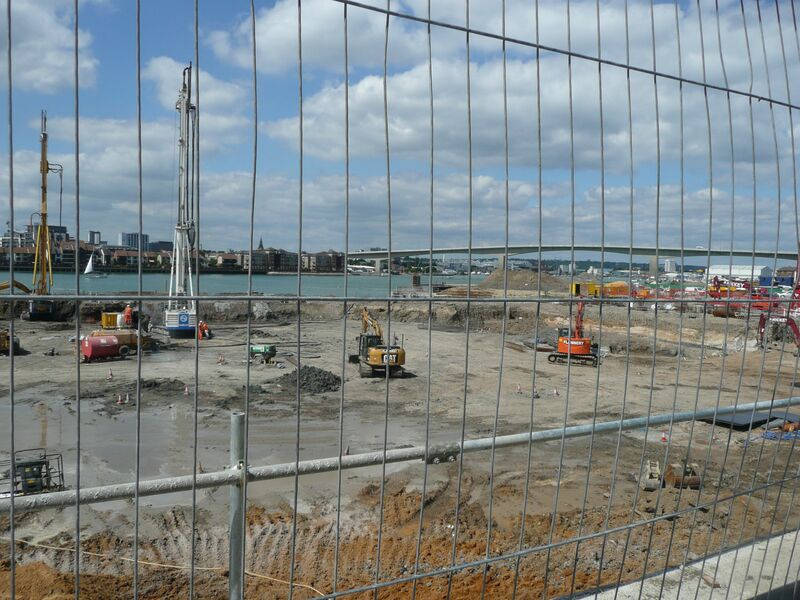 With some trepidation I walk up the steps leading to the massive grey span of Itchen Bridge. A sign catches my eye and as I wobble across the bridge, fast traffic just a little too close, I see these signs at regular intervals. Trying not to think of people hurling themselves into the water I take a few shaky photographs. Down the other side, through the gloom of a subway, I navigate myself down to Town Quay where I wait for the Hythe Ferry. The ticket collector, supplying me with change for the ferry, reveals that the following day there will be three cruise liners in the docks and that they will all be making a staggered departure from 16.30 onwards. One of them is the Queen Elizabeth – I make a mental note to encourage Damian to come earlier than planned and to bring the binoculars! 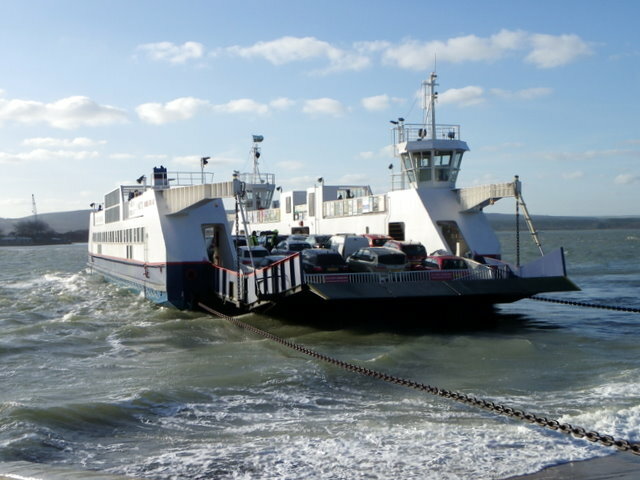 The Hythe ferry appears somewhat ramshackle compared to the catamaran jet which has just roared its way out of the harbour towards the Isle of Wight. It does however provide its passengers with spectacular views of the port and the oldest, sweetest electric pier train in the world – but more of that tomorrow. Clarence Pier funfair is resting this morning and the air is clear and still. I am one of very few people out walking along the promenade in the early morning sun. Following the trail of engraved stone slabs laid to celebrate the Millennium, I am guided through the shadows of St. James Fort and out the other side, stopping for a brief moment to look at a young girl in a bikini posing for photographers at the water’s edge. The photographers are both middle-aged men and it makes me feel a little uneasy. 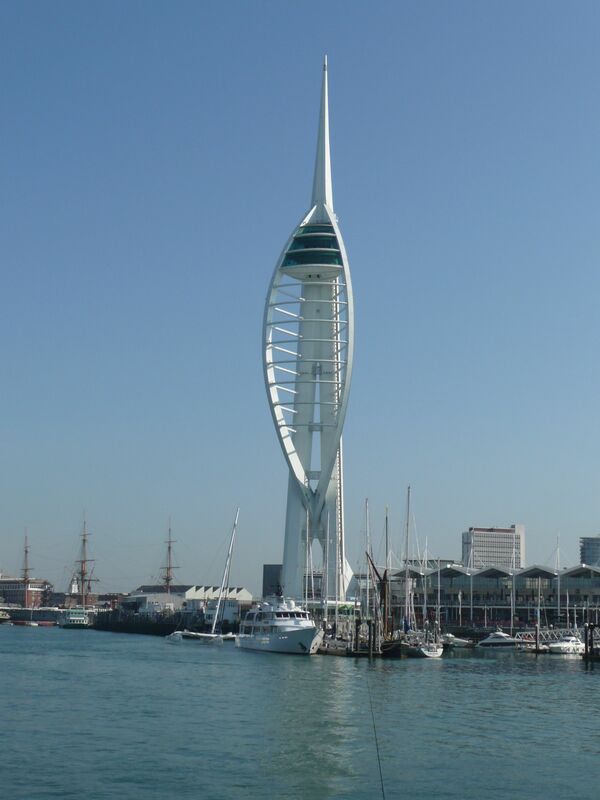 Anyway, on I go following the trail, passing boats gently rocking on the water and a few historic buidings, the ever present Spinnaker Tower a dental white against the bright blue sky. I have decided not to go up the tower but keep that experience for the day Damian and I take the ferry to Brittany. Suddenly I come to an abrupt end where the chain motif of the pavement disappears under a boundary fence of a building site. 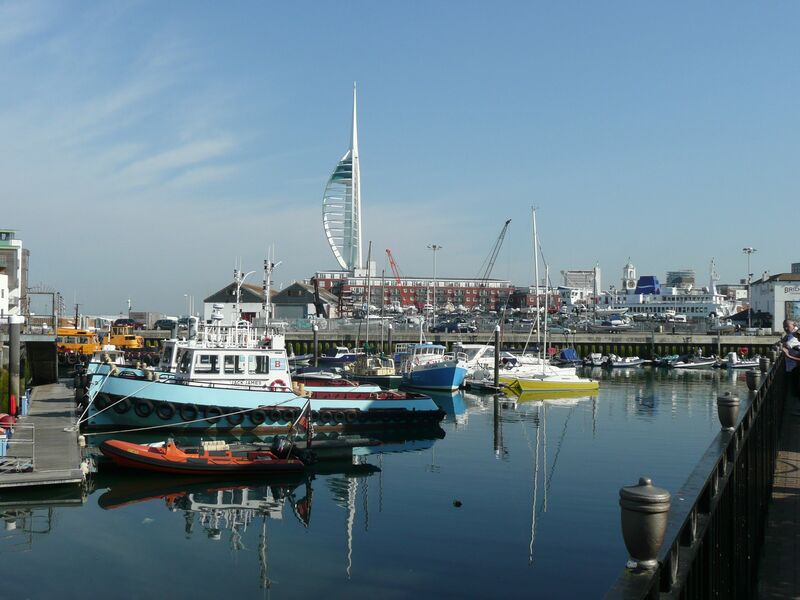 Following directions from a passer-by I make my way towards Portsmouth Harbour railway station – where I take the ferry to Gosport, accompanied by a tail wind of shrieking seagulls. 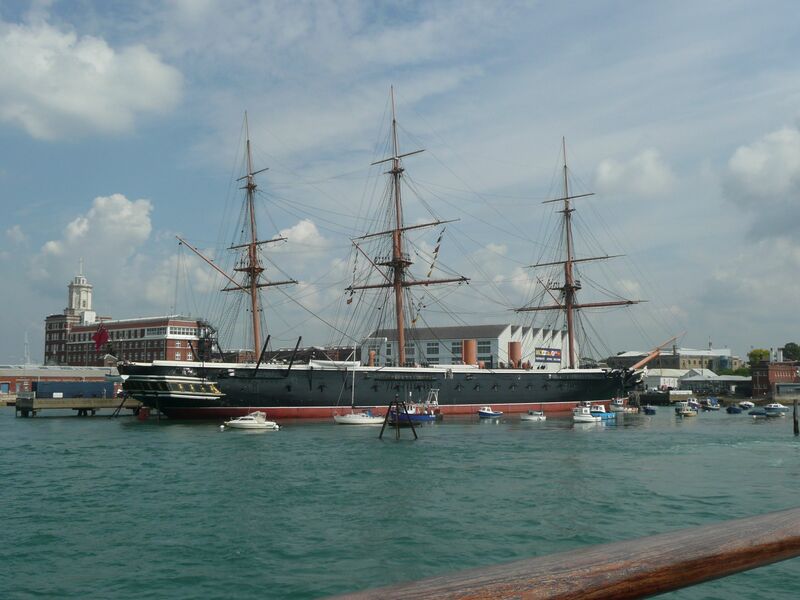 From the ferry I take a few photos of the magnificent HMS Warrior, a nineteeth steam and sailing warship which was built to fend off the French. From Gosport the footpath marked on the map follows the road for quite a while. 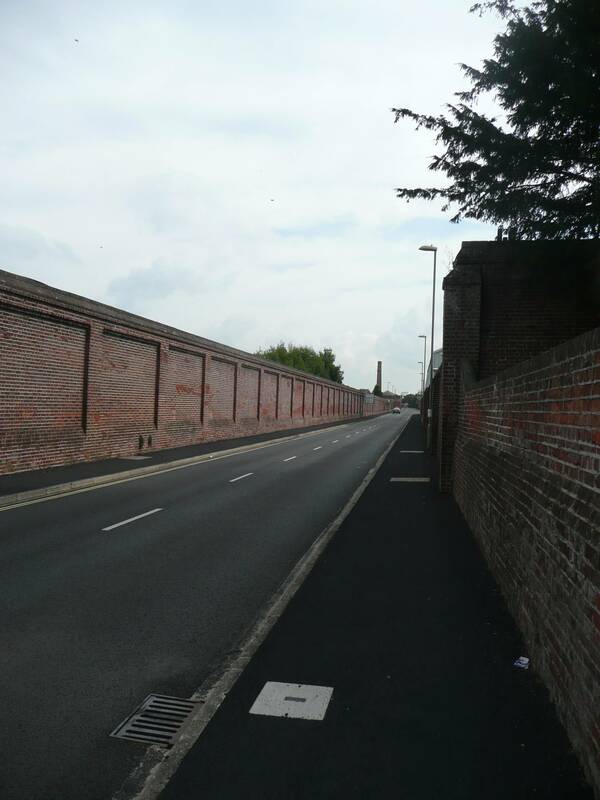 On both sides a very impressive red brick wall hems me in, but thankfully there is very little traffic. And it is then, at the end of the road, I discover to my horror, that I have left my iphone charger in the room of my B&B. It takes me an hour to retrieve the charger and be back at the same spot where the ghastly realisation took place – another lesson learnt the hard way. About 30 minutes later, after walking past the intimidating hulk of what I later discover is an Immigration Removal Centre, I follow a footpath back to the water. 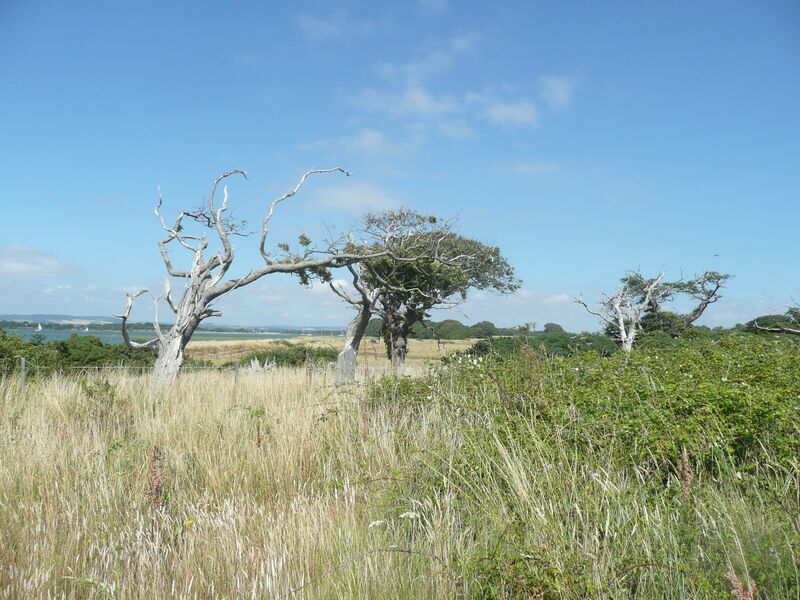 The path cuts through a golf course overlooked by the centre and I reflect upon the painful irony of the arbritrary fortunes of those in the “holding pen” and the ladies of Gosport engaged in a gentile game of golf. 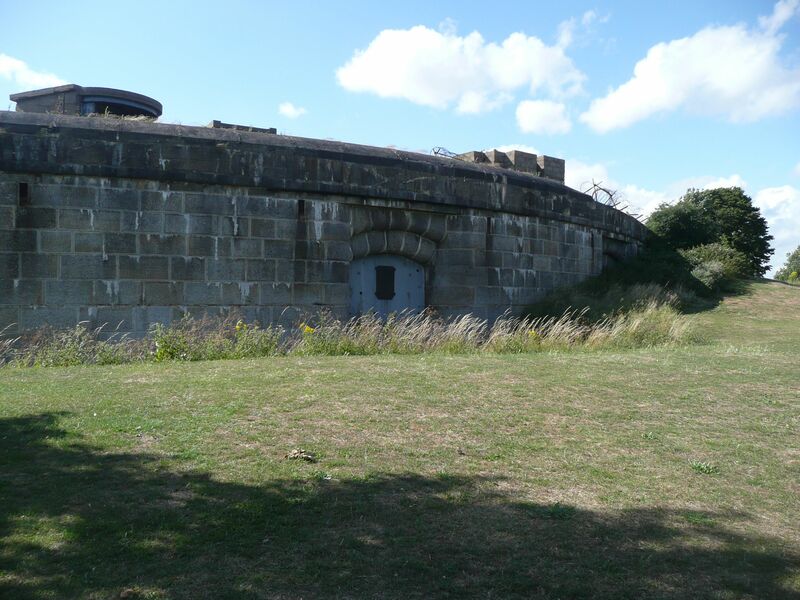 Off to the right is Gilkicker Fort, a Victorian coastal fort which is now closed to the public. 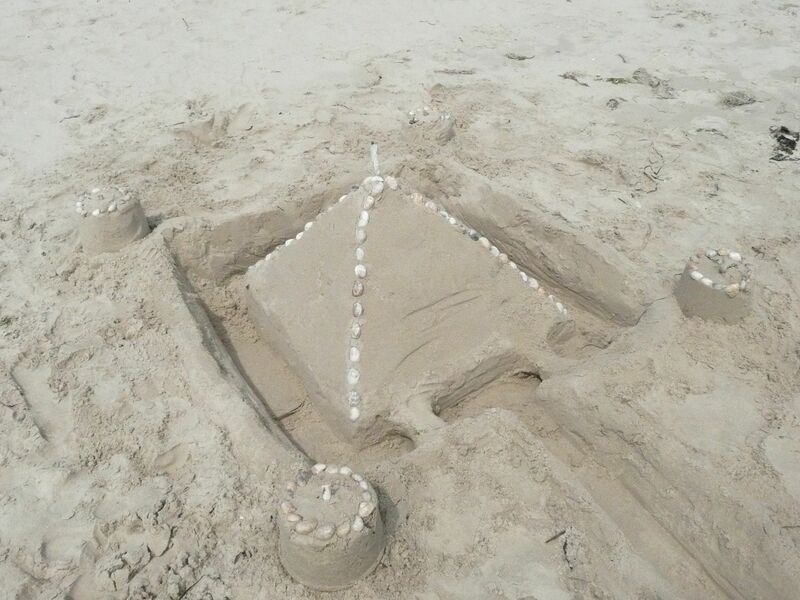 The plans are now in place to build a very different kind of fort – luxury houses with what I imagine will be their own private beaches – snort! 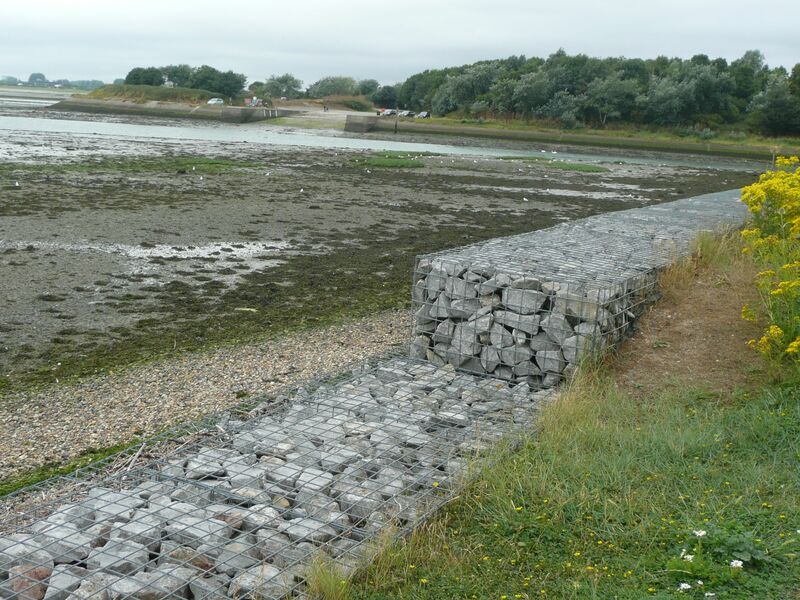 From here on the hard shingle path continues until it turns into a “proper” promenade at the lifeboat station. 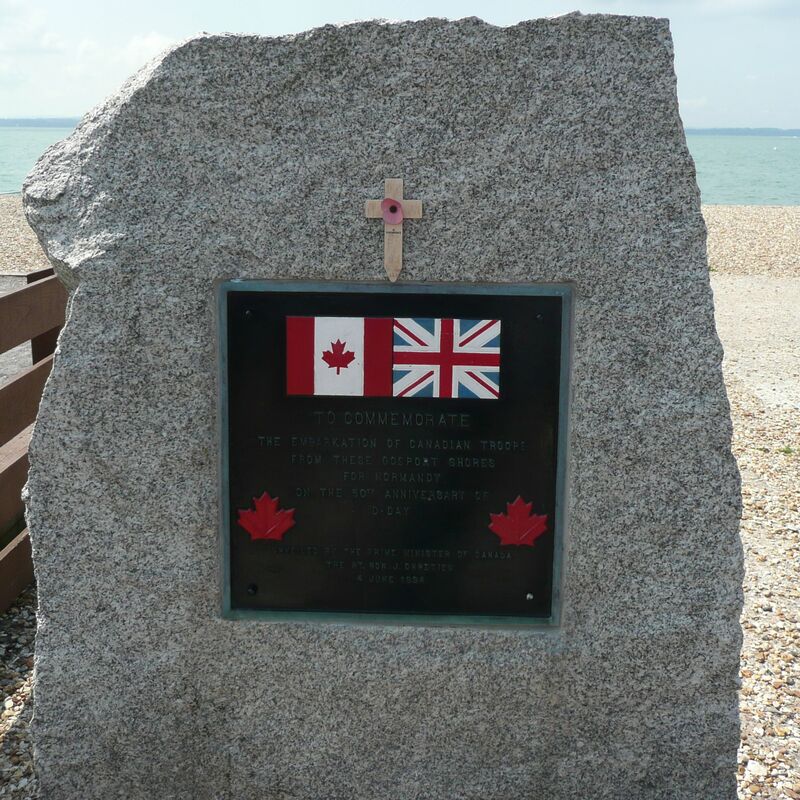 I walk past yet another second world war memorial – this one to Canadian forces who used the bay as a launch point for the D-Day landings. 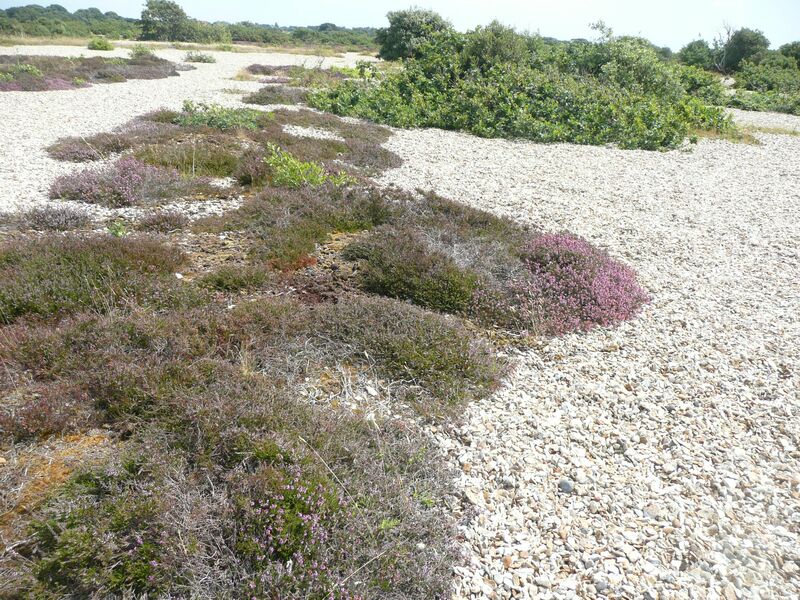 Eventually the path turns into shingle and after reading the information board about the conservation of coastal plants, with a warning not to step on them, I enter into a long stretch of shingle beach known as Browndown. This used to be a military training ground and as I trudge along in the deep shingle, the sun beating down on my hatless head, I start feeling like a soldier training for her next mission in Irag or Afghanistan. There is no-one around and the future is shingle. 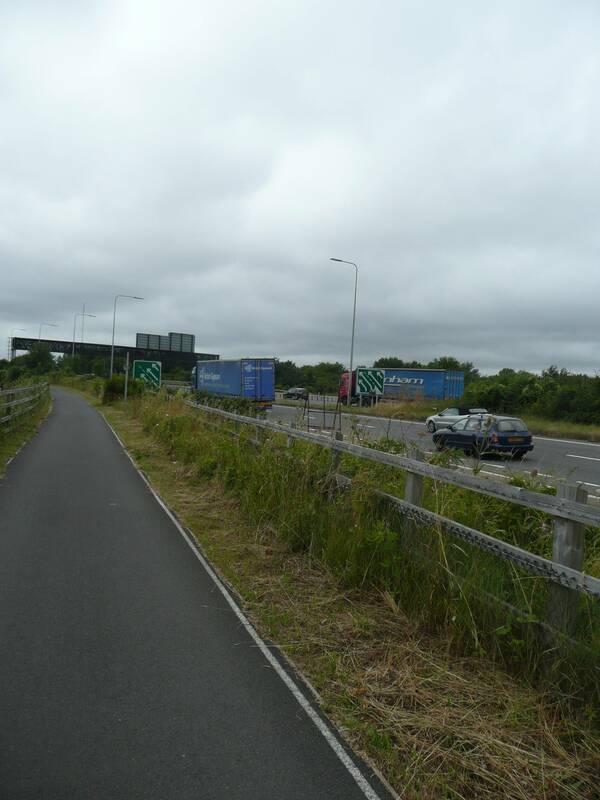 After a long while I spy a lone cyclist wearily pushing his bicycle – goodness knows why. I stop to ask him if he knows of an alternative path and he reassures me that the shingle will soon get more compacted and easier to walk on. It doesn’t and I am ashamed to say that I now resort to leaping from one clump of vegetation to another, hoping and praying that they are not the most threatened type of coast plant. Eventually it gets easier and following well worn paths I end up at Lee-on-the-Solent where I sit and eat a well earned ice-cream. 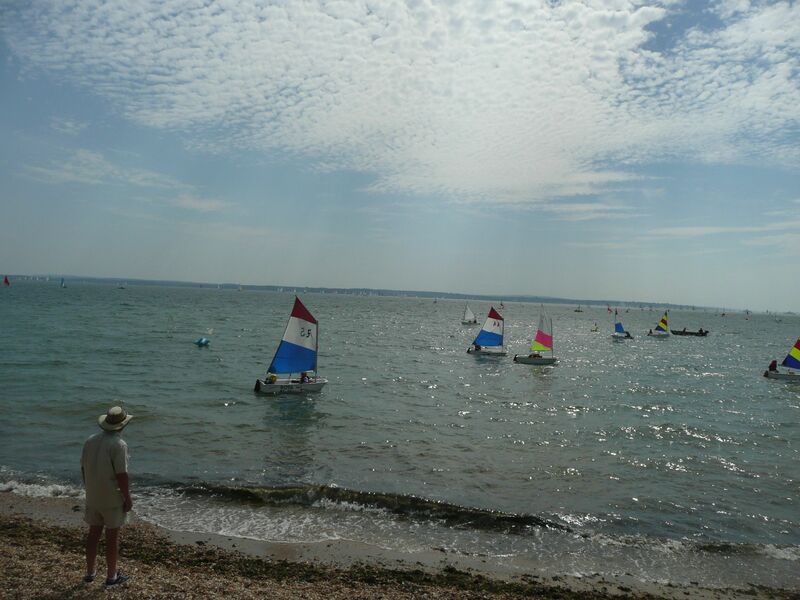 Still following the Solent Way I walk towards Hillhead Harbour where a children’s sailing competition is in progress – the brightly coloured sails of the twenty or so mirror dinghies catching my attention, as does the trainer barking instructions from the shore. 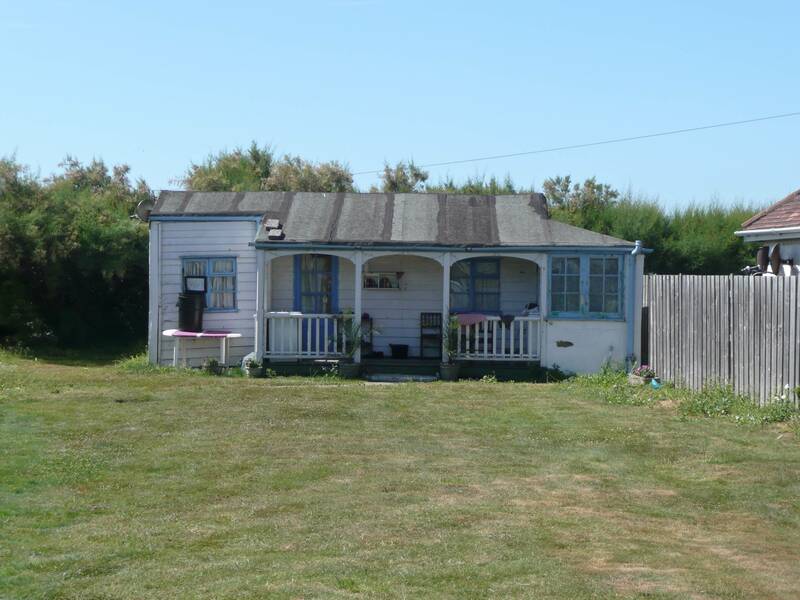 As I walk past the harbour a beautiful shire house clops by with a young girl perched on its broad back. 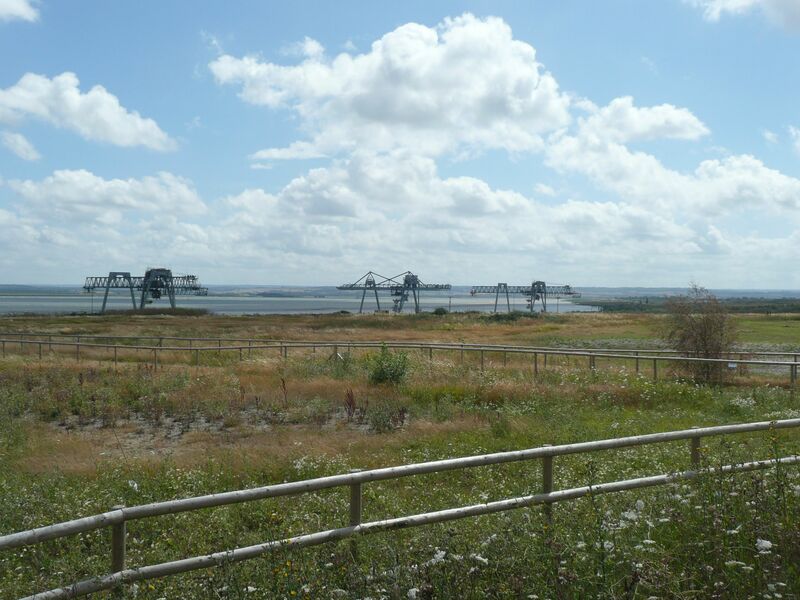 To my right are the marshes of Titchfield Haven, I see two groups of people busy with binoculars. A while later I am on shingle again but not for long. Ignoring the signs saying private beach I walk past a row of cosy beach houses and spy a grassy path winding its way up the cliff. After a short consultation with a sweaty but jubilant cyclist, I decide to forgo walking on the muddy beach and take the inviting path up into a cool green shady world with the occasional porthole of sea views. 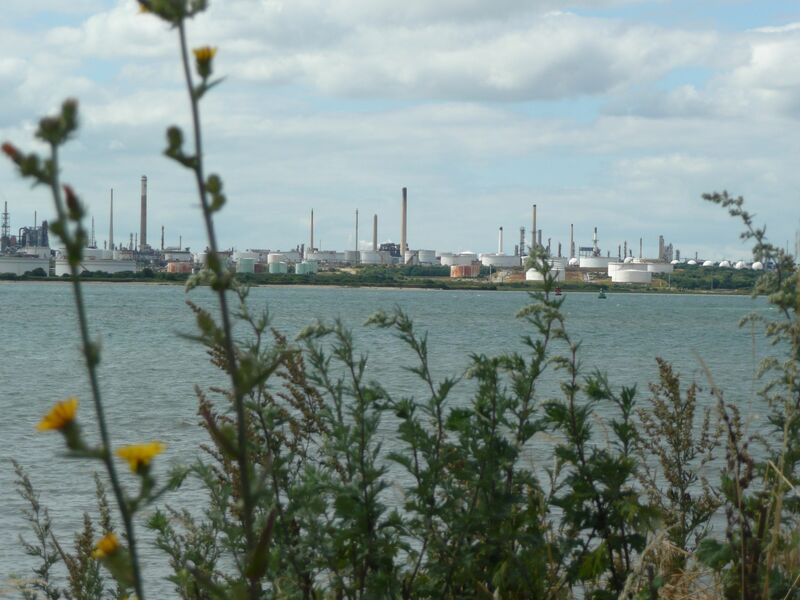 Emerging from this lovely path I can see the chimneys of the power station and oil refineries of Fawley – a difficult navigation for the very near future. 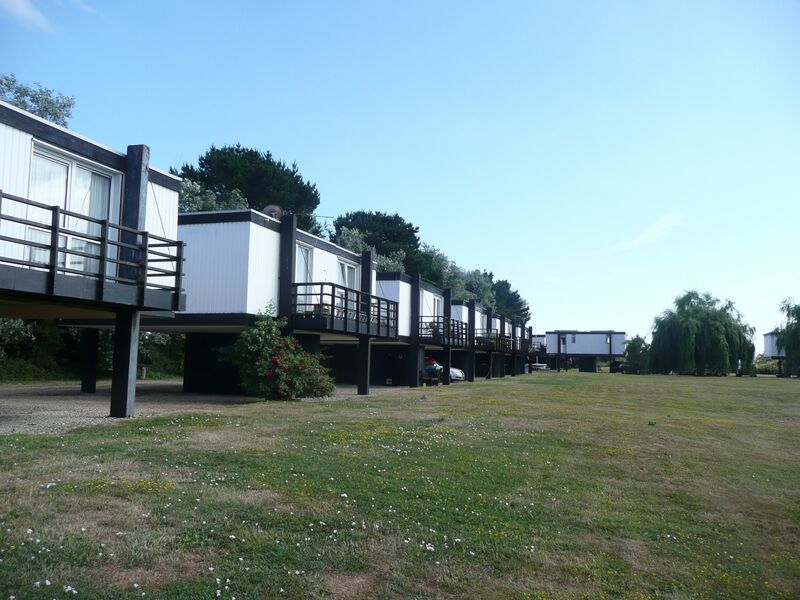 Unwilling to skirt around Solent Breezes Holiday Park (out of my way, this is my coast as much as yours etc. etc.) I waste valuable time trying to find the path. 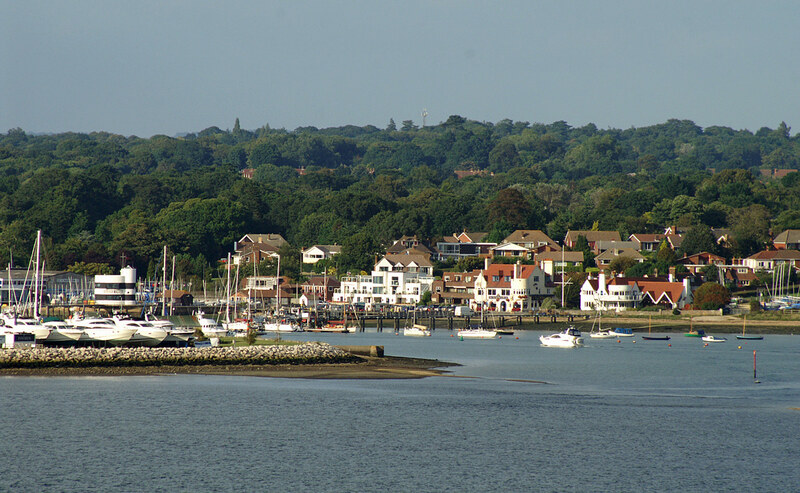 Eventually I follow a promising dirt track which leads me back to the beach, and a clear run up the bank of the river Hamble to the marinas and, what I’m told, are the millionaire properties of Warsash. It has been a long but satisfying walk and I’m looking forward to a cold beer, a shower and bed. Sometimes life can be so beautifully simple. Not wanting to subject my friends to the dark side of coastal walking I have cherry-picked today’s walk. We are a group of four – my old friend Sharon, her daughter Flo, sister Helen and dog Mitzi. The forecast is promising but on the train from Portsmouth to Poole I am already worrying about whether it will be a bit too hot for my friends to walk the eight or so miles to Swanage. 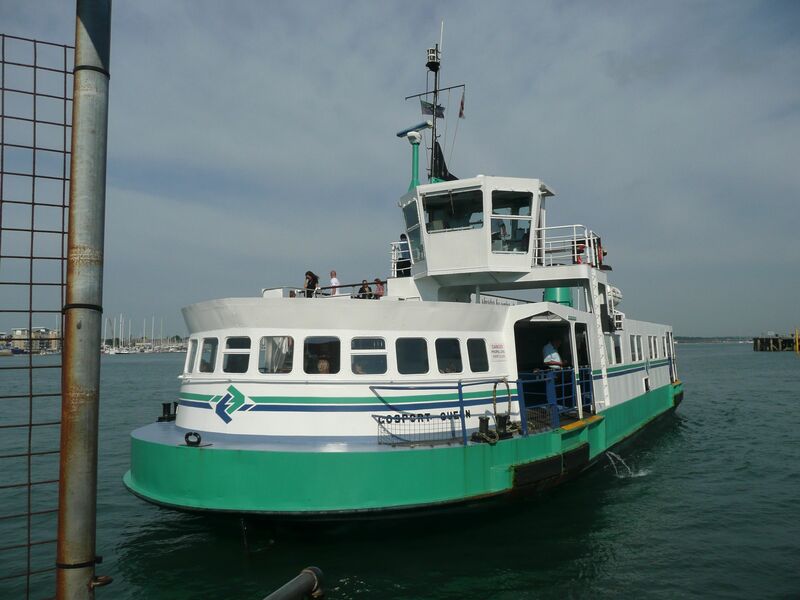 Getting off the bus at Sandbanks we head for the ferry which we are told takes about 5 minutes and costs a pound. I had read about this ferry running on chains to stop it being swept off course by the strong current across the mouth of the harbour and I wanted a photo. 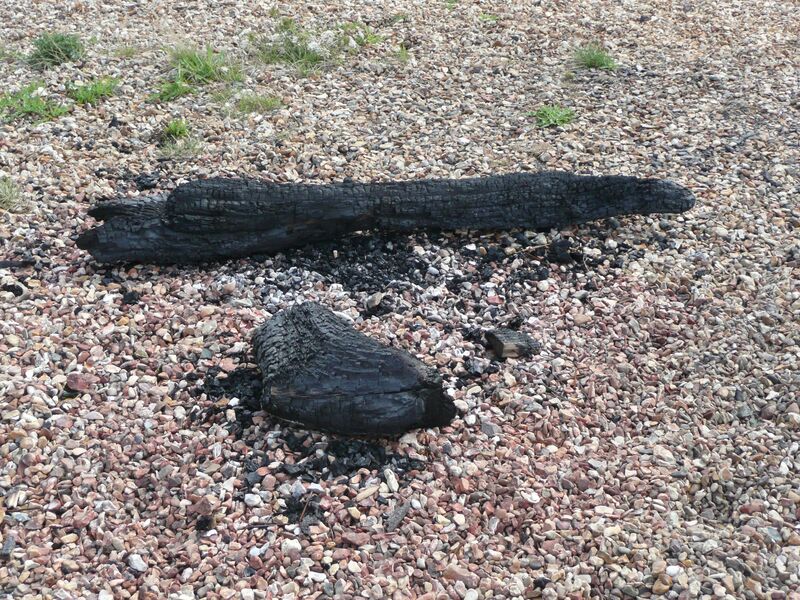 Unfortunately the timing was wrong so this photo is taken from the Internet. The sea breeze onboard is cool but deceptive so when we step off the ferry on the other side the heat hits hard. 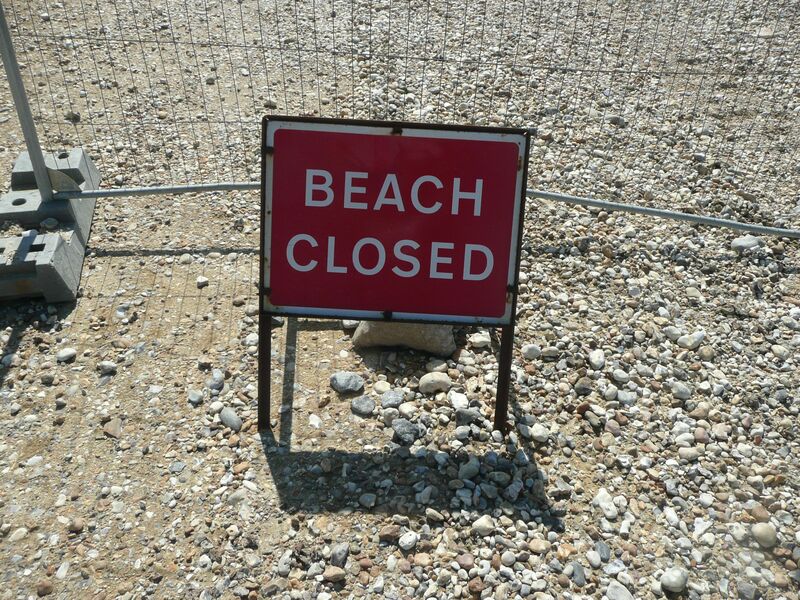 To make matters worse, it seems like half the population of southern England have decided to spend the day on the beach and the sign at Shell Bay says no dogs. 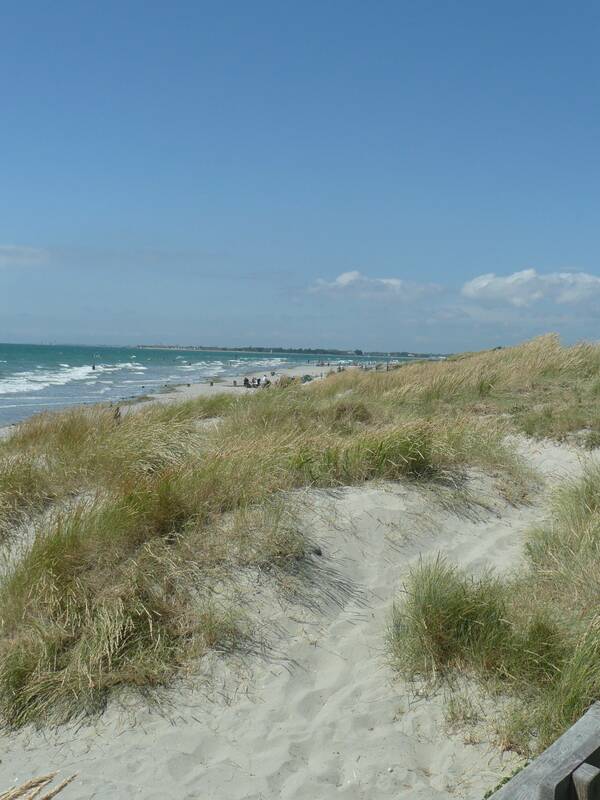 After a few minutes trying to come up with an alternative we realise there isn’t one, so acting on advice from a local we brave the crowds, keeping to the dunes first and then opting for the slightly easier option of wet sand close to the sea. Blinded by the midday sun it takes me a while to realise that there are naked bodies scattered about, both men and women, and to realise that we must have reached the part of Studland Beach where nudism is allowed. A healthy looking blonde haired woman with large breasts is playing beach volleyball with her son – an image reminiscent of Hitlers’s idealised vision of an Aryan master race. Picking our way through sandcastles, shrieking children and determined sunbathers we soldier on, trying to find alternative paths – front of the beach huts, back of the beach huts, through the woods, until finally the beach stops and there are only the large rocks of the headland. Flopping down onto a small grassy bank we decide to stop for an ice-cream and a rest before making our way up the hill to the start of the cliff walk. A panting Mitzi looks on, pink tongue hanging out, I hope we can give her some water soon. Twenty minutes later we are on our way up and then down the tarmac road to the start of the cliff walk. Here, there is room to breathe, quite a few walkers but nothing compared to the ferment below – time for a photo. From left to right this is me, Helen and Flo. 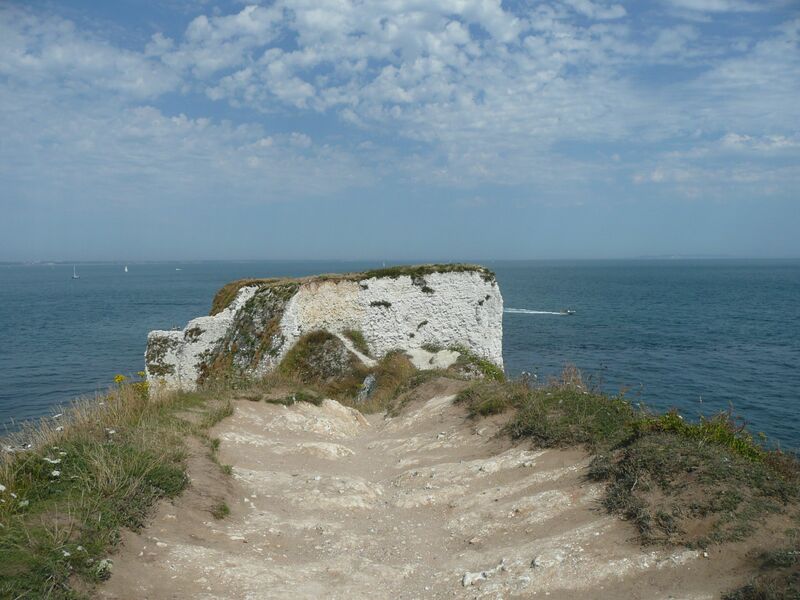 After a while we come to Handfast Point and the dramatic Old Harry Rocks. 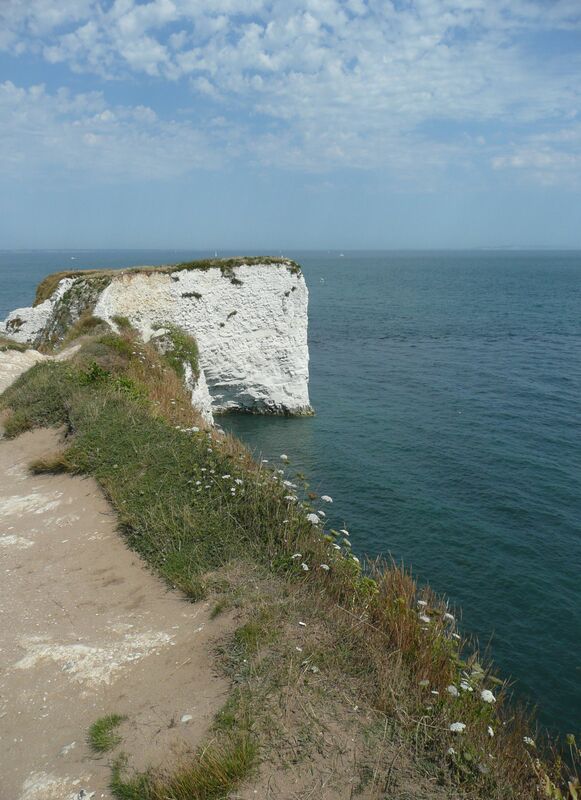 These consist of a stack and a stump of eroded limestone that now stand apart from the cliff and form part of the Jurassic Coast. 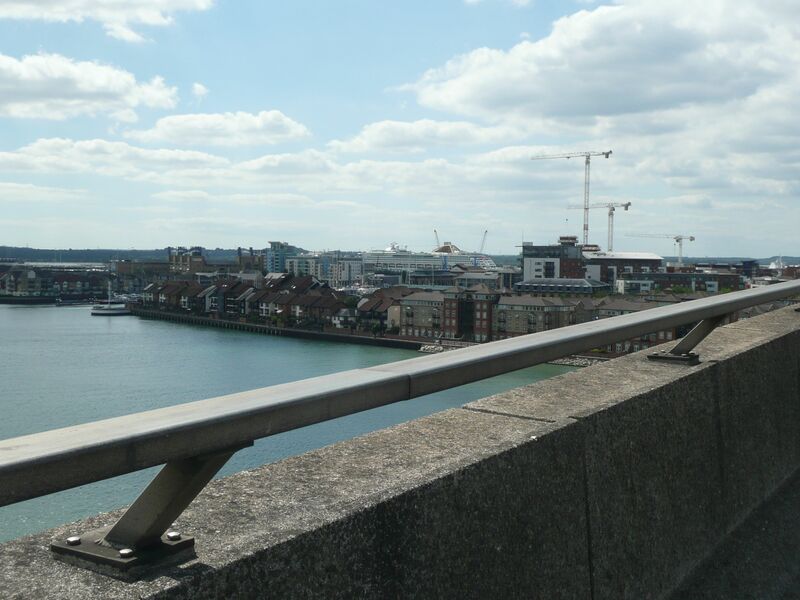 As teenagers do, Flo immediately skips off along the narrow path as far as she dares, which is way too far for me – but I am not good with heights. 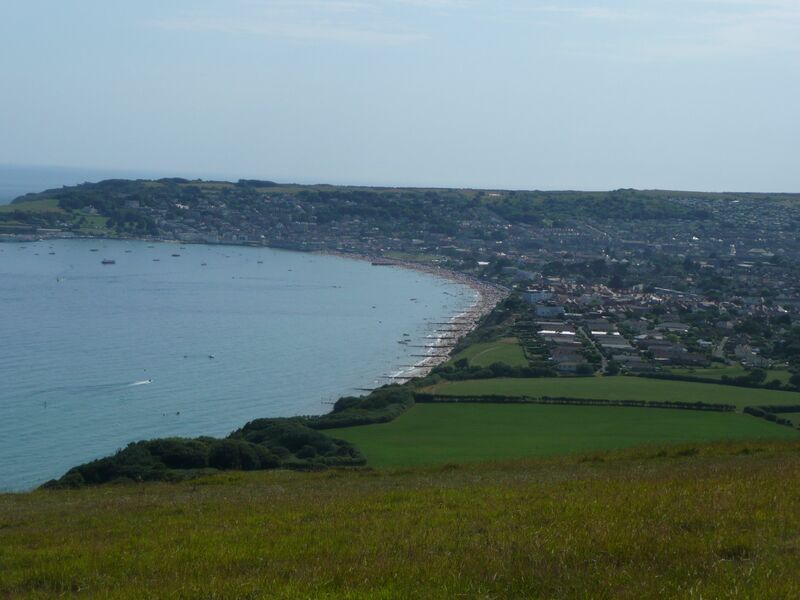 By now we can see Swanage twinkling in the sunshine below and as we stand staring rather despondently at another packed beach we catch sight of some paragliders trying to manoeuvre themselves into launch positions from the cliff edge. 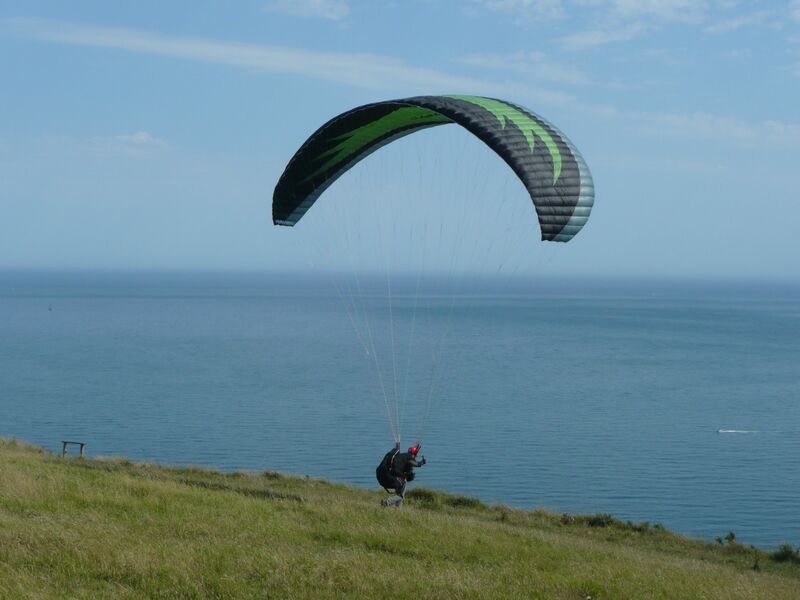 Eventually one of them catches the wind and gently takes off towards Swanage, swooping down to what to me looks like a sea landing. 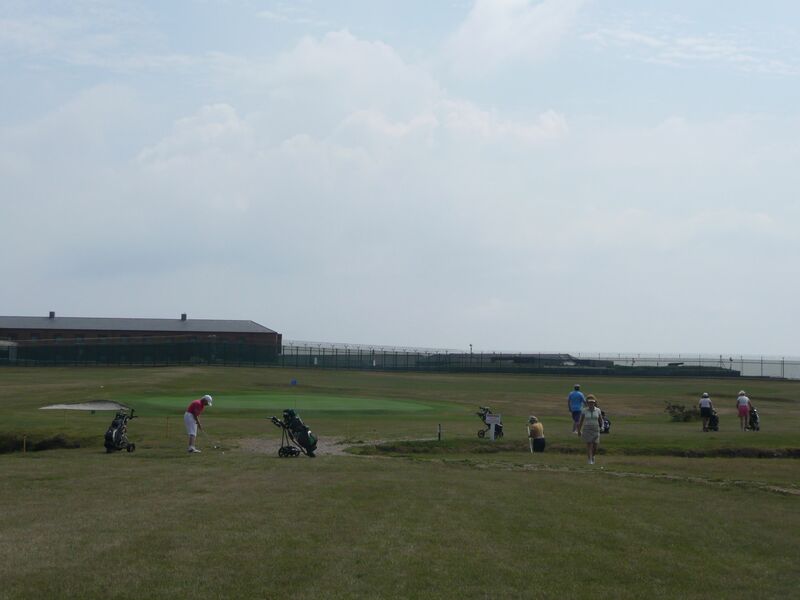 But of course he knows what he’s doing and expertly directs himself down into a green field behind the beach. “I want to do that” says Flo – and perhaps she will. 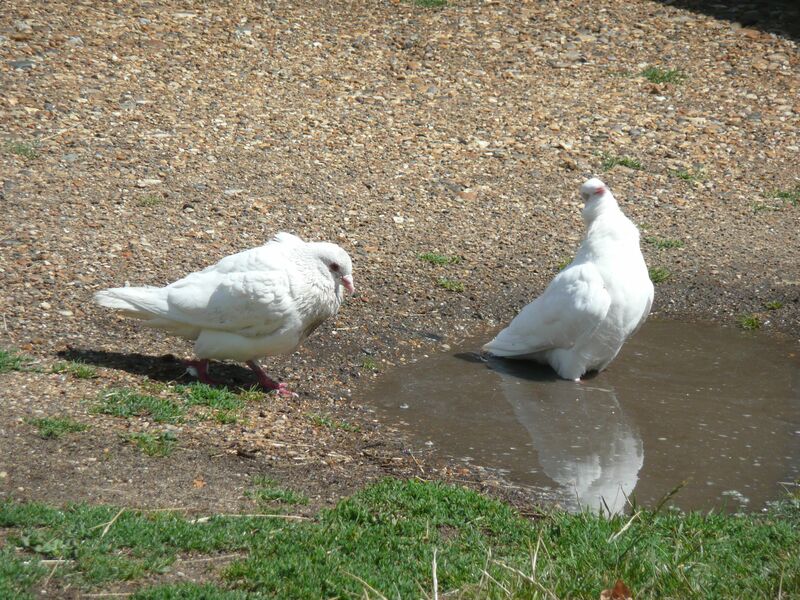 By now Mitzi’s eyes are rolling with thirst and Sharon has a headache – water is needed. So down we go following the stony path until we emerge into a residential area and find a corner shop to buy more water. Wine gums and mints appear but there’s nothing for poor old Mitzi – the rule bound shopkeeper cannot help. So she must wait until we reach the beach where Sharon and I go swimming and we all sit round the table on the terrace of the beach cafe, drinking lager and eating chips. 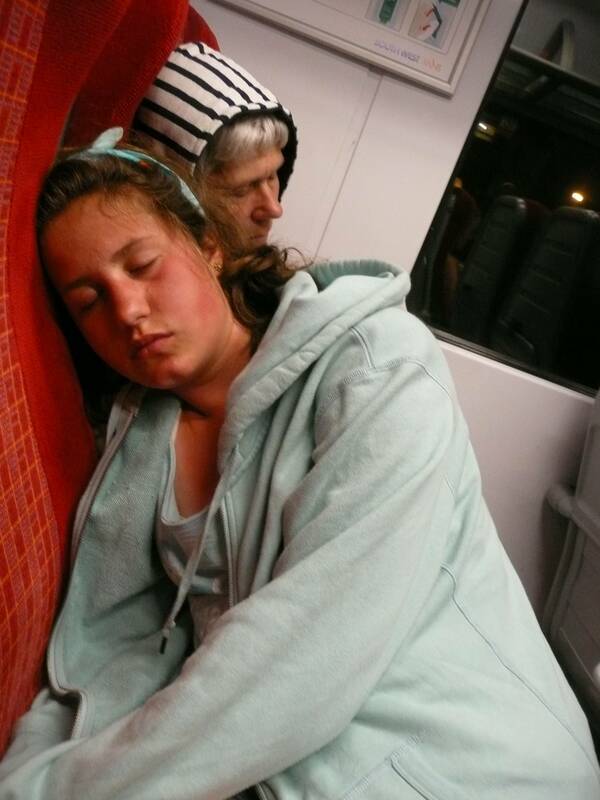 Sleep comes easily on the train back to Waterloo – I hope a good day was had by all. 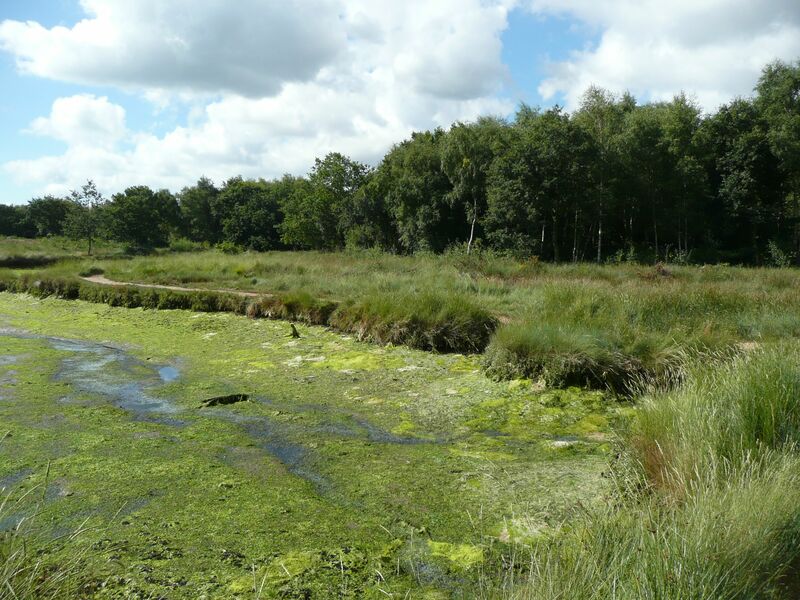 After a little searching I find my way down to the Promenade, a wide path circling a pond. 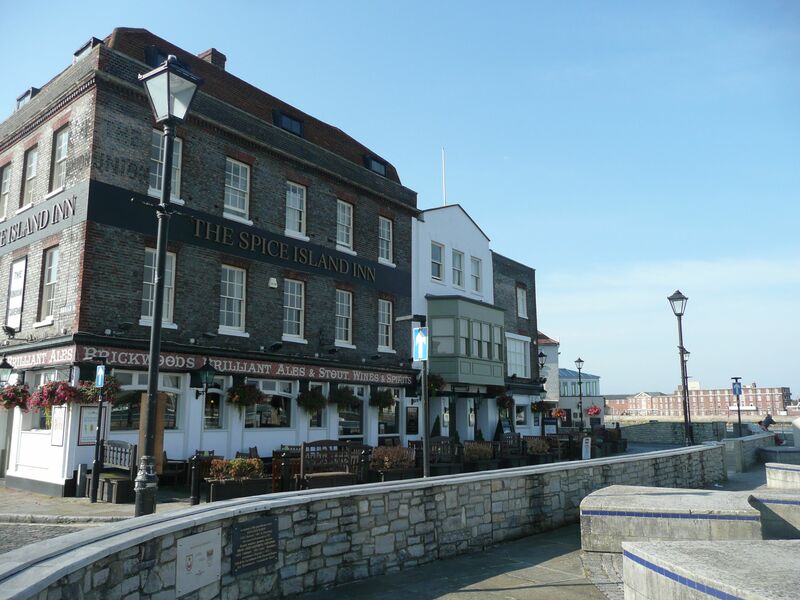 Known as Fisherman’s Walk, the information sign tells me that it was originally built to enable fishermen to gain access to the oyster beds off Haying Island. Well I hope they had better luck than me at “gaining access” as my path soon narrows down to a faint passage through long grass and mud and stops at a fence with cows on the other side. I am obviously not meant to go any further so I turn round, walk back in the direction of town, ask a few locals and eventually end up on Mill Lane. 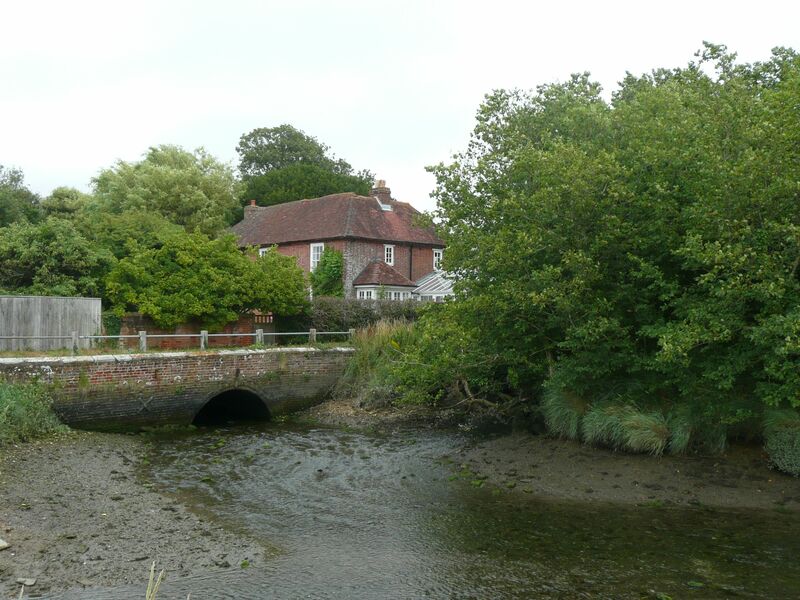 The serenity of Mill House calms my irritation and soon I am out on the sea wall heading for Langstone which I can see in the distance. The tide is out so I am able to walk on the shore, trying not to slip on the slimy seaweed – I pass a few boaty people in wellies and am treated to a string of cheery greetings. 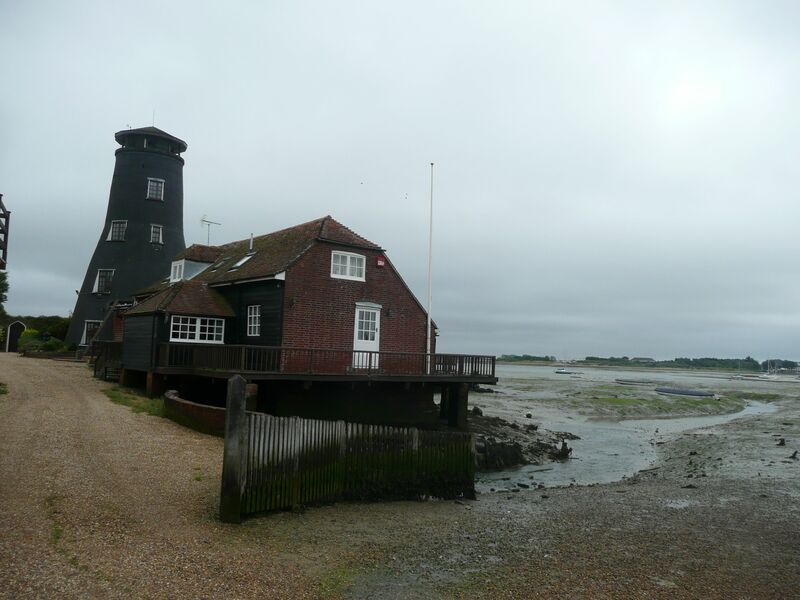 My next stop is Langstone Mill, a tide mill derelict by 1934 and restored as a private residence in 1939. and a little later I stop at a pub for a cup of tea. 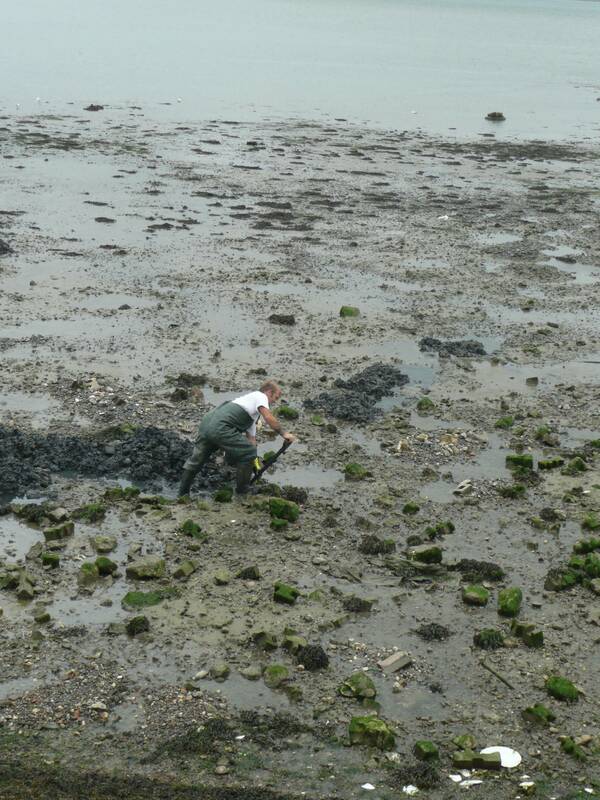 Refreshed I pick up the sea wall again, the entertainment being provided by scores of men energetically digging in the mud. I assume it is for fish bait – ragworms I’m told. I also come across the big wire parcels of stones that were everywhere on the coast around Brighton – used to protect the sea bank from erosion. In the distance I can see and hear the traffic rushing over the bridge to Hayling Island – this is the road I will have to cross to get me back onto the Solent Way. I get to it soon enough and about a mile later the path turns inland to circle a large recycling plant where two very sunburnt workmen stop what they’re doing to stare at me, probably wondering what on earth I find of interest in this part of the coast. 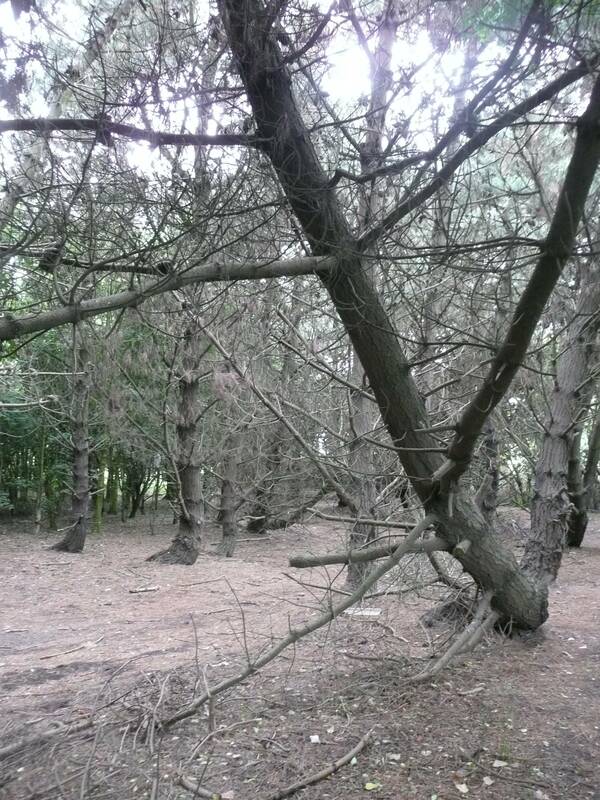 The path takes me through flowering bushes, busy with bees and butterflies and then plunges me into the gloom of a copse of evergreen trees, some of which look very dead. The path is soft with fallen pine needles but it finishes too soon and I am soon out again on the baking tarmac of a road running through an industrial estate. Having trouble finding the path I ask a truck driver who sends me down the next turning left and back to the shore. From this point on nothing really happens. I trudge along a cycle path running parallel to the A27, realising that I am bound for Farrington Marshes with no food in my rucksack and no sign of any cafe or shop for miles. Searching in the dark corners of my rucksack my fingers close around a forgotten withered apple – amazing how good things can taste when you’re hungry. The marshes are beautiful, the bird song and sunshine momentarily taking my mind off my hunger but closing the gate of the nature reserve behind me I see where I now have to go………..an intimidating motorway intersection looms in front of me with a complex pattern of cycle paths and pedestrian crossings. I eventually make it to a service station and stand transfixed in front of the sandwiches in the cooler. Feeling just a little out of place I find a small piece of grass and eat my “lunch” vowing to plan my provisions a little better in the future. Onward ever onward, thinking it can’t be far to Portsmouth, I cross a bridge over Broom’s Channel and back to the sea wall, a sign on the fence of a sailing club making me chuckle. 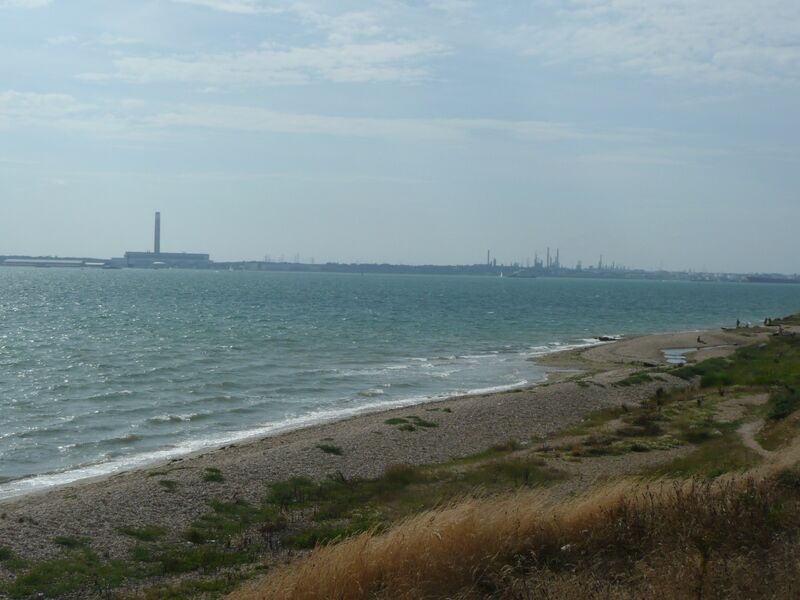 I am now on Portsea Island, marshes on my left and the outskirts of Southsea on my right. 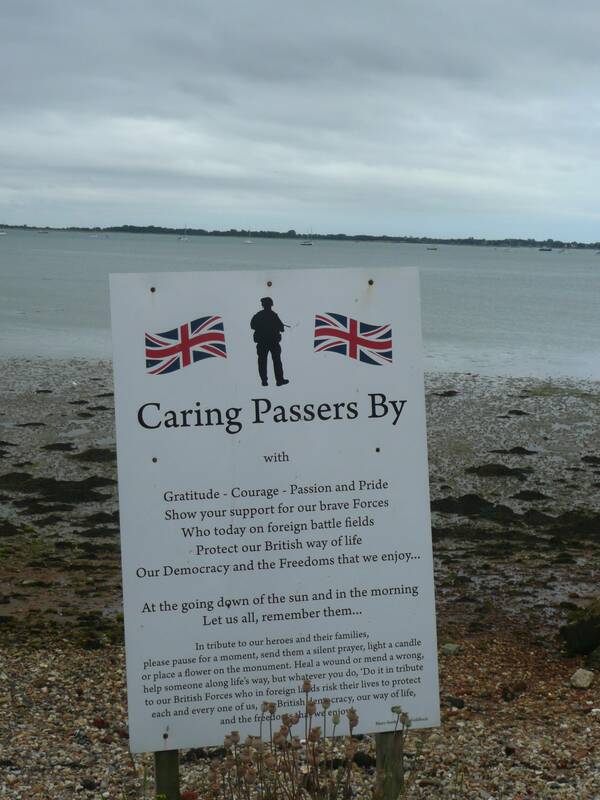 I walk through Milton Common, stopping to read the sign encouraging a moment’s thought for lost servicemen. Next to the sign is a shrine to leave a flower or some other form of recognition and thanks – I give it a few moments’ thought. I then come to a stop at a pub where the path seems to go no further. 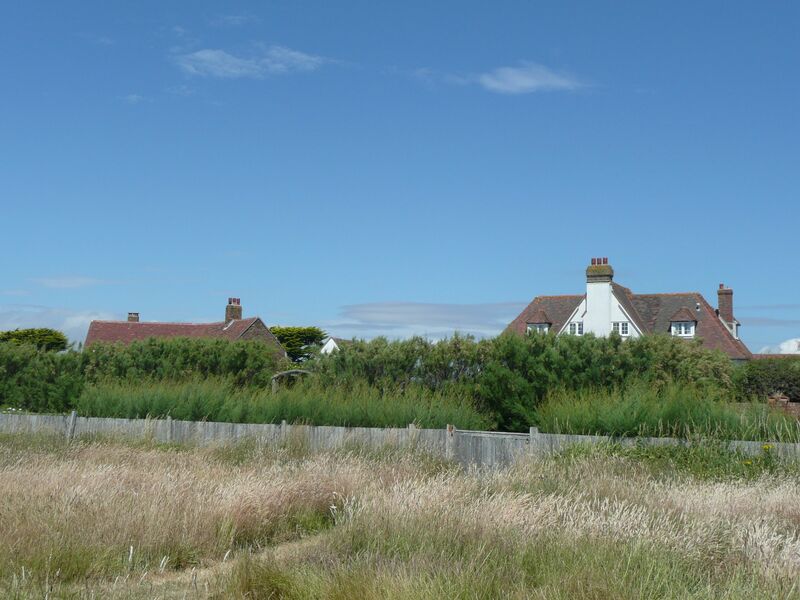 A local drunk tells me I can walk along the shoreline so round the back of allotment gardens I go, picking my way through litter and mud until I climb up into a housing estate with no redeeming features and completely devoid of colour. 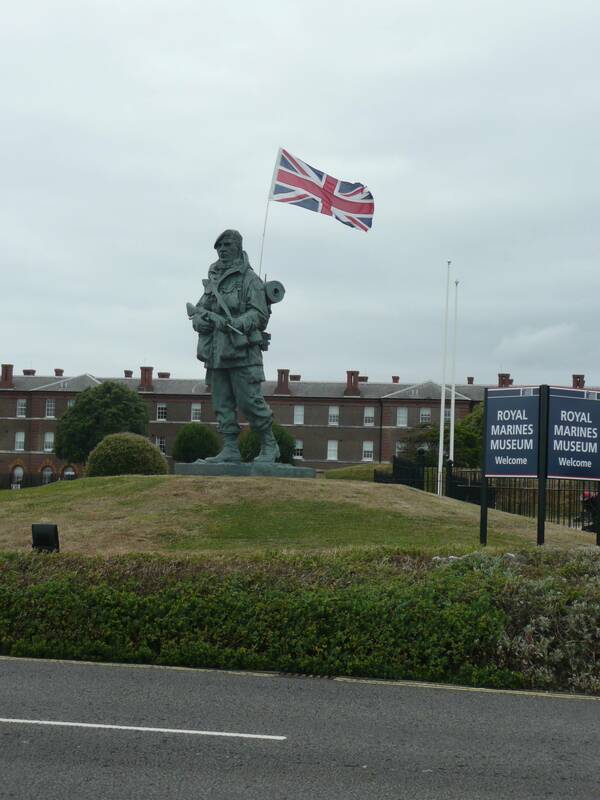 My heart sinks as by now I am feeling very tired and still no sign of Portsmouth proper. Limping along the pavement I barely manage to overtake a bowed old gentleman shuffling along, his lottery ticket clutched tightly in his right hand. 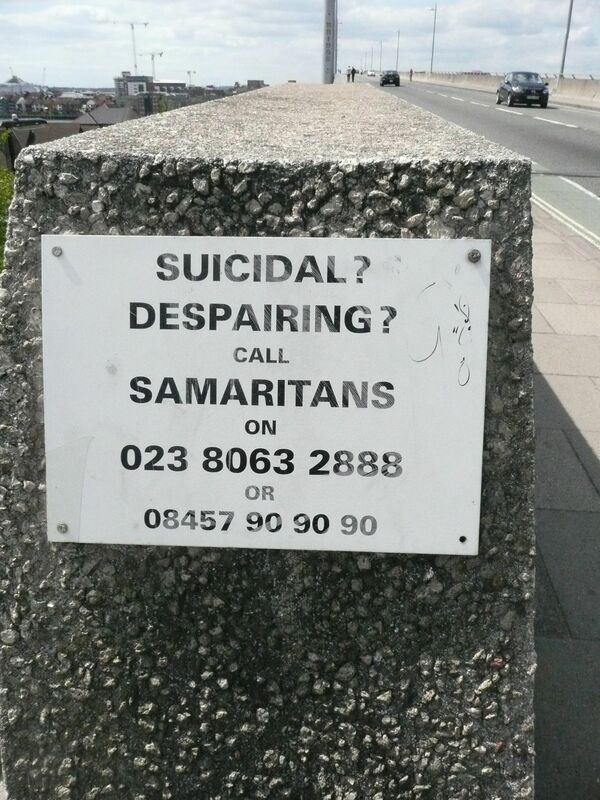 Just as I am beginning to despair I round a corner and there is the sea, the real sea with the very long Southsea Promenade stretching into the distance. 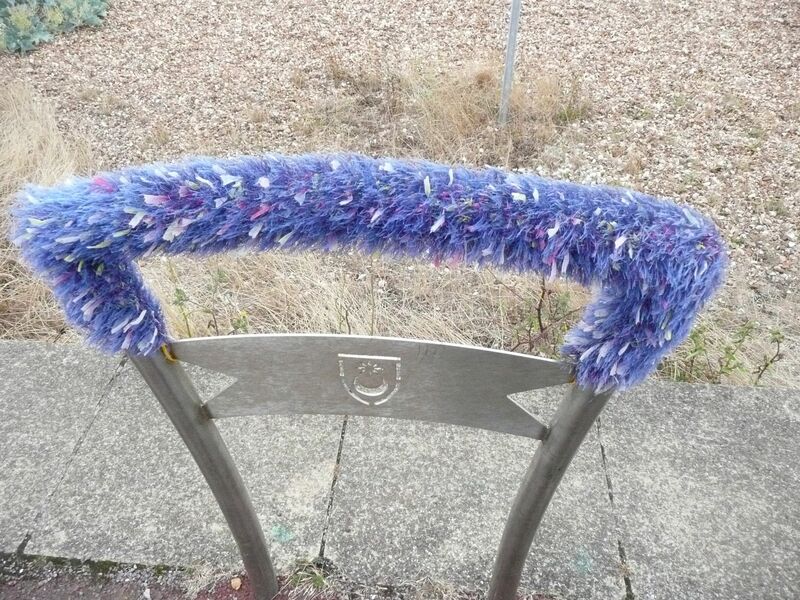 I am on the home stretch, past the Royal Marines Museum and the bike racks with their knitted covers (no idea!) 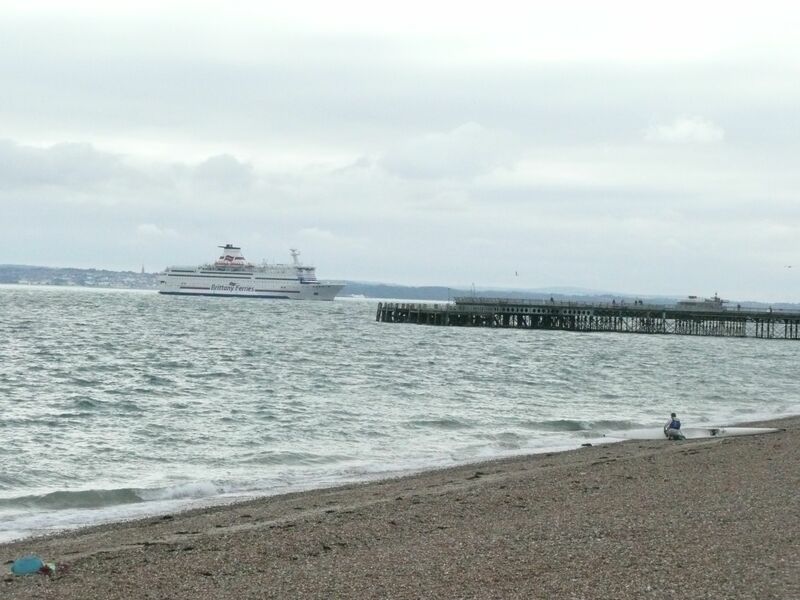 and on to where I can see the Britanny ferries edging their way into the harbour. I finally reach the glitter of Clarence Pier and desperately ignoring the wonderful smell of fish and chips I turn inland to find my B&B. 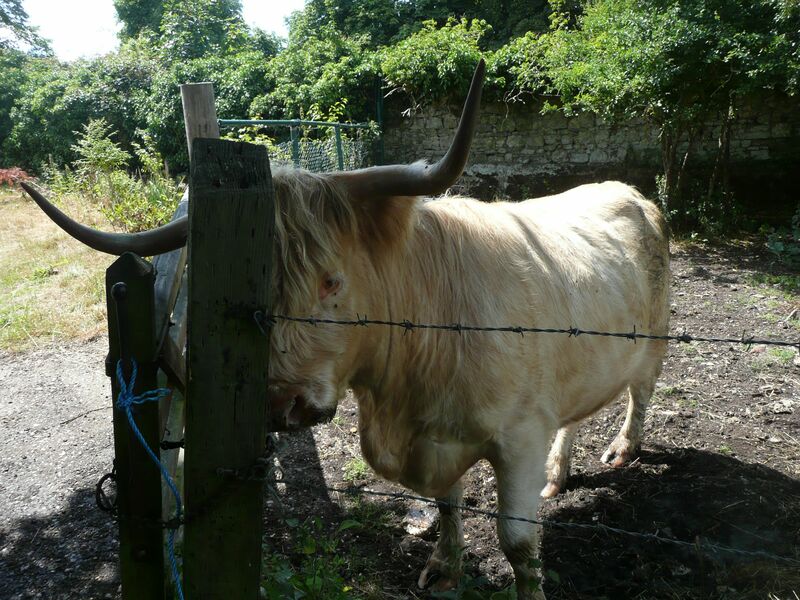 After a while the path takes me past a farm which boasts a solitary, bad-tempered cow with an impressive set of horns and a yard full of cooing doves. Realising that Mucking Church is now a private residence I take a look at the map to see how best to get back to the river. 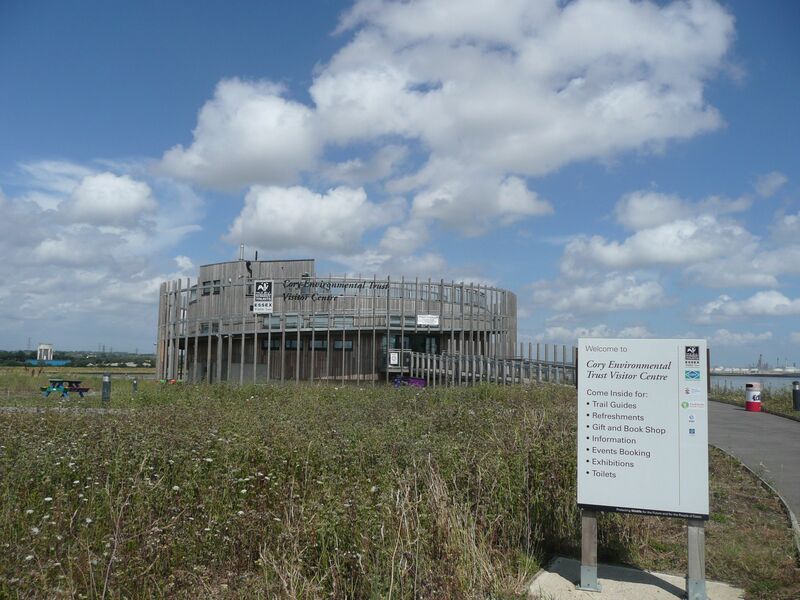 Taking advice from a passing local I follow the signs for the newly created Thurrock Thameside Nature Park, an area that has recently risen from the ashes of the Mucking Marshes landfill site. 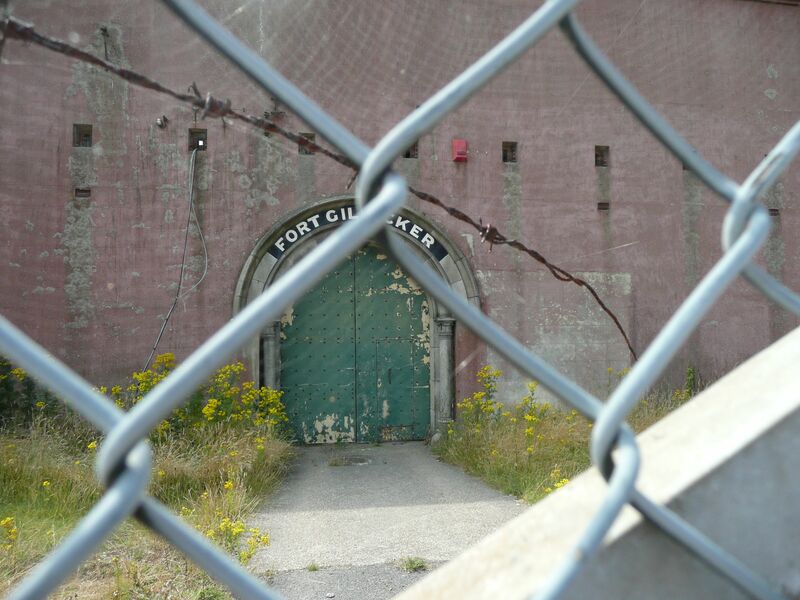 At the visitor centre I learn more about the plans to restore a much larger area by 2016, which partly makes up for the disappointment I feel when I’m told I cannot walk the seawall from here due to all the work being done. 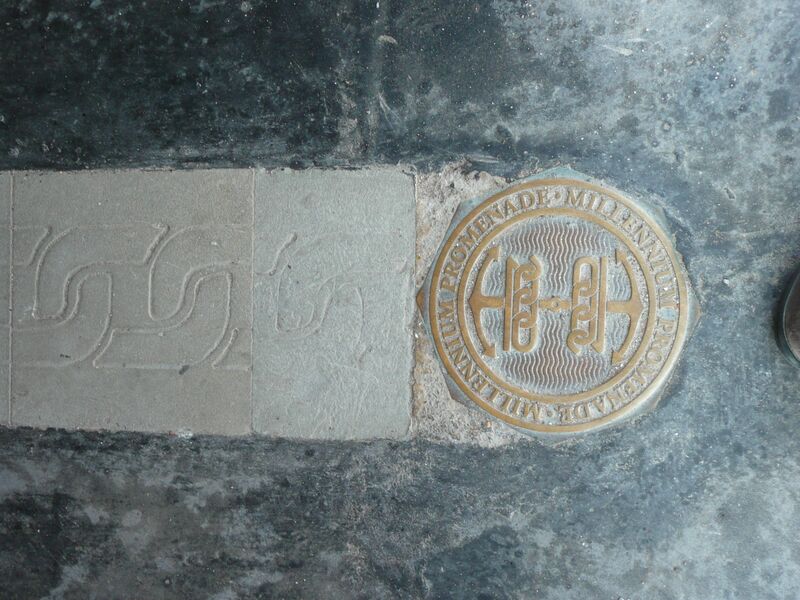 Where I could have walked……. 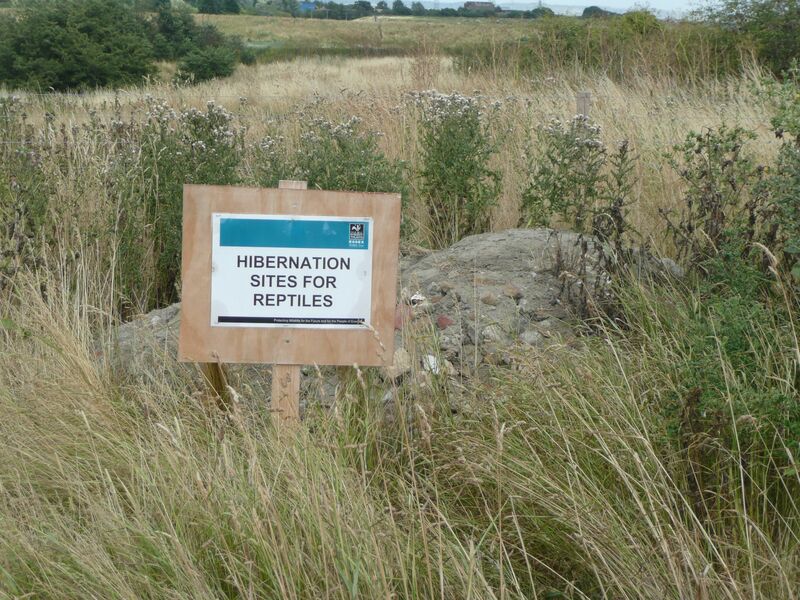 So, back down the footpath I go, my frustration slightly tempered by an interesting sign which keeps me on my toes…….. 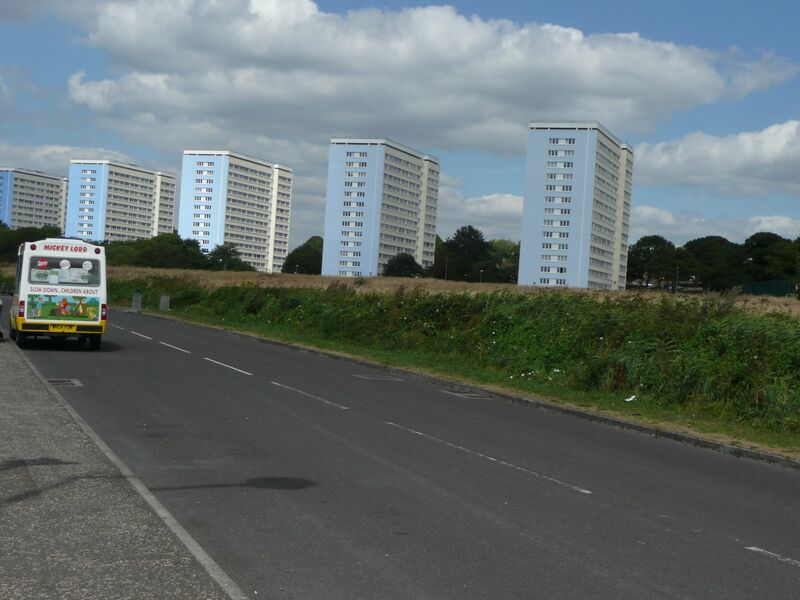 The tedium of the walk on the road to East Tilbury is slightly alleviated by the need to avoid getting run over. The traffic is moving fast on this narrow road and because there are quite a few bends I find myself zipping from one side of the road to the other like a fly trying to avoid getting swatted. After a while I am relieved to see the footpath sign off to the left which will take me back to the sea wall. The first part of the walk is through a playing field and past the backs of some tatty looking houses, but soon I find myself alone on a narrow path stretching only to the next bend. With a high fence on one side and overgrown hedges on the other I cannot see out and I start to feel a little uneasy. To make matters worse I keep seeing single magpies and I’m getting very tired of saluting! Rounding a corner I see two young men in the distance, leaning on their bicycles. Although I realise I’m being silly my heart starts thumping and head down I start walking towards them. One of the bicycles is blocking my path but as I get closer one of the boys moves it to let me pass and says sorry. All my anxiety melts away and five minutes later I am scrabbling up a bank in a sudden strong wind to face the mighty Thames. 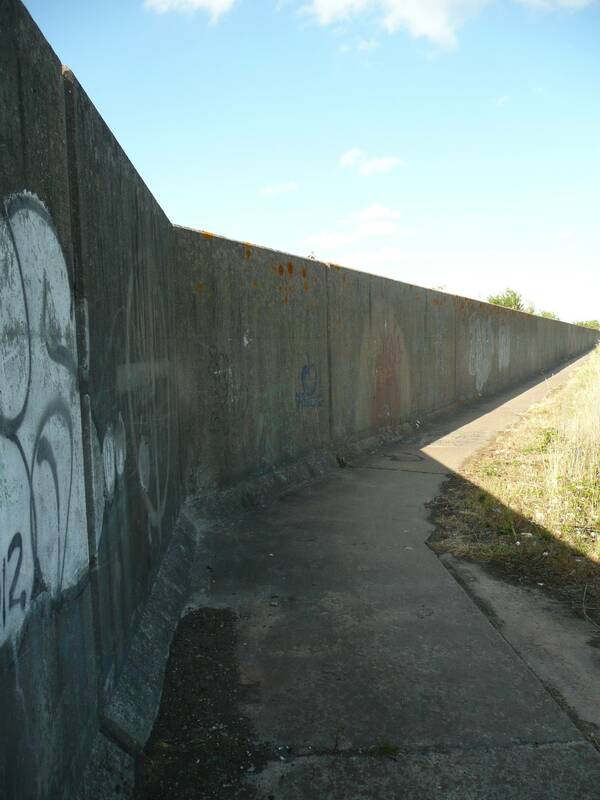 I turn right and from now on it’s straightforward sea wall walking – in the sunshine. 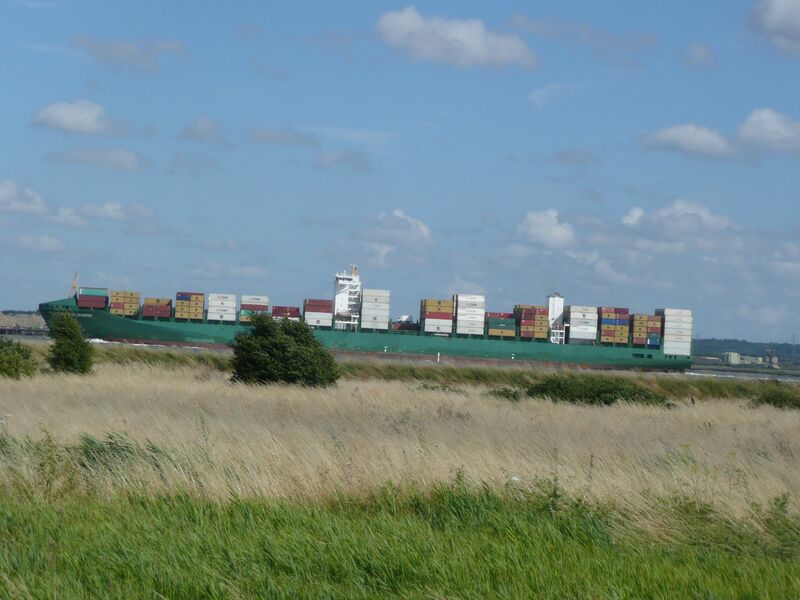 I am amazed and excited to follow the slow movements of the massive container ships grinding up the river out of Tilbury and happy to see the landscaped gardens of Coalhouse Fort ahead – I need a place to sit and eat my sandwiches. 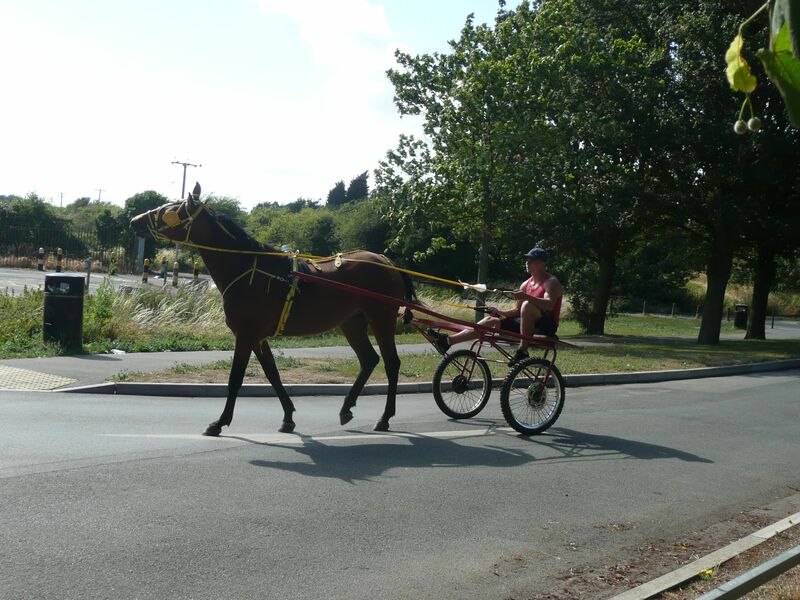 As I sit wriggling my bare toes in the soft grass a racing trap appears, the horse skittish and blinkered – when I take a picture the driver gives me a friendly smile. 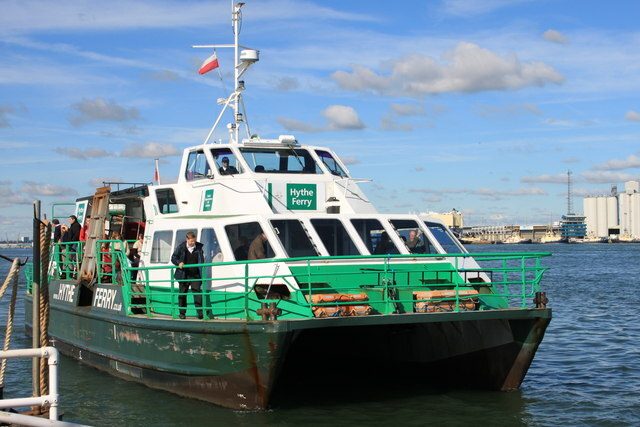 But it is now time to get going again, I don’t want to miss the last ferry from Tilbury to Gravesend. 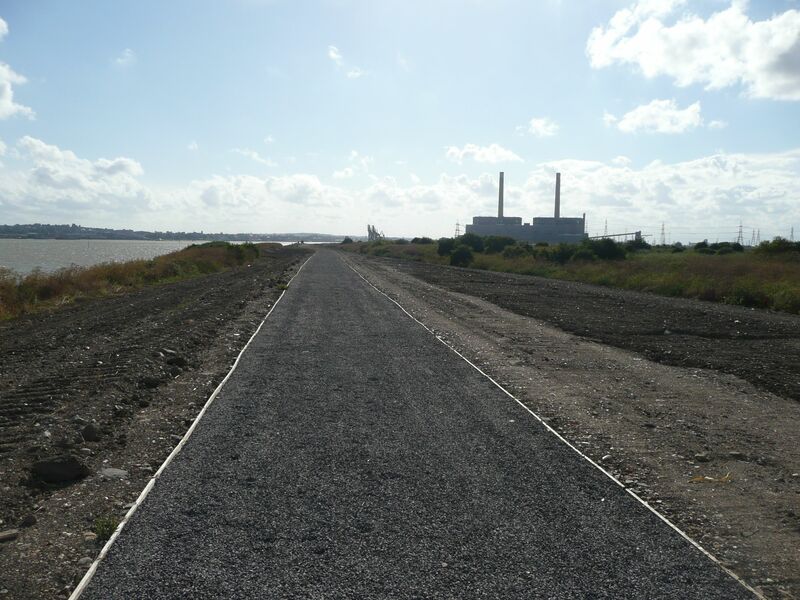 Packing up I head off back onto the sea wall which takes me closer and closer to the chimneys of Tilbury Power Station and after fending off the curious stares of a number of hard hatted workmen I take a path that looks like it was laid that morning. My footsteps are probably some of the first to crunch the virginal gravel. After a while the road stops and reverts to a grassy path which twinkles in the sunlight. I’m thinking this must be an old landfill site and the glass is from broken bottles. As I get closer to the power station I am directed down onto a path next to a very high concrete wall. 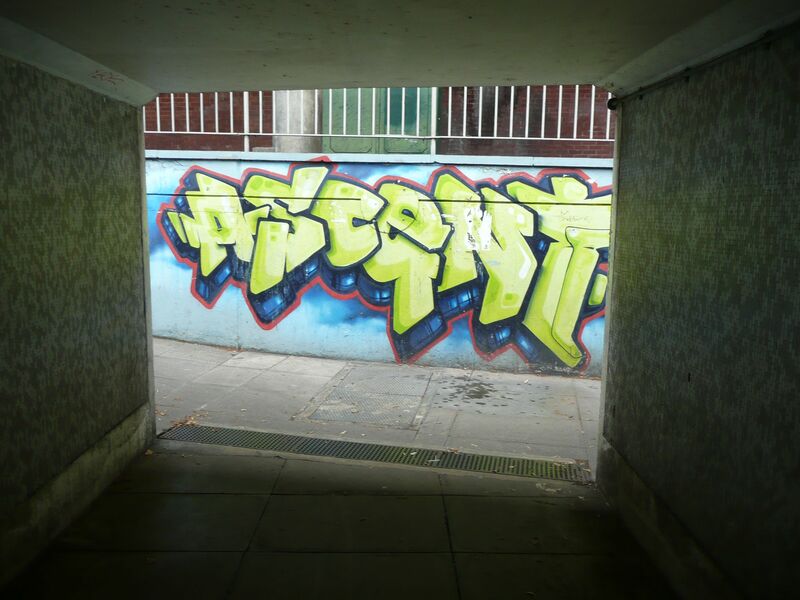 The wall is covered in graffiti and crude drawings. 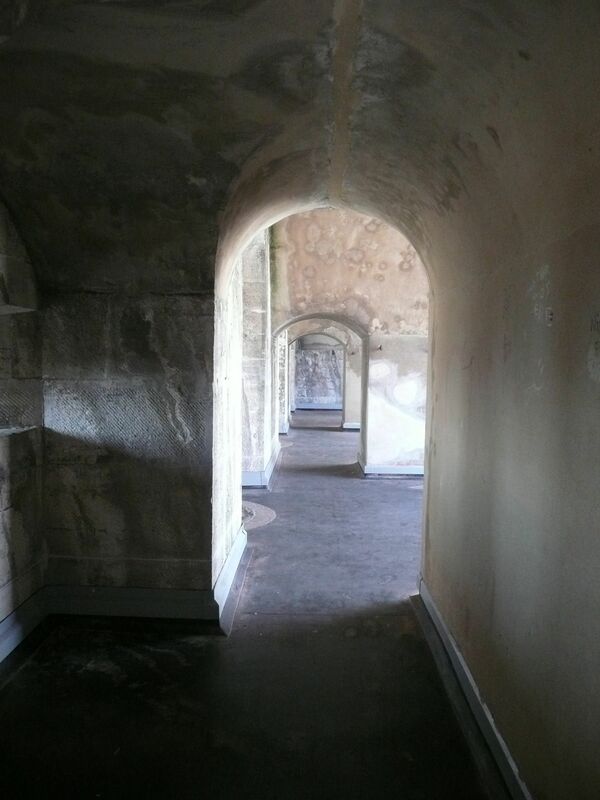 Now I have no choice but to follow this wall and it seems never-ending – I just hope it is not a dead end. 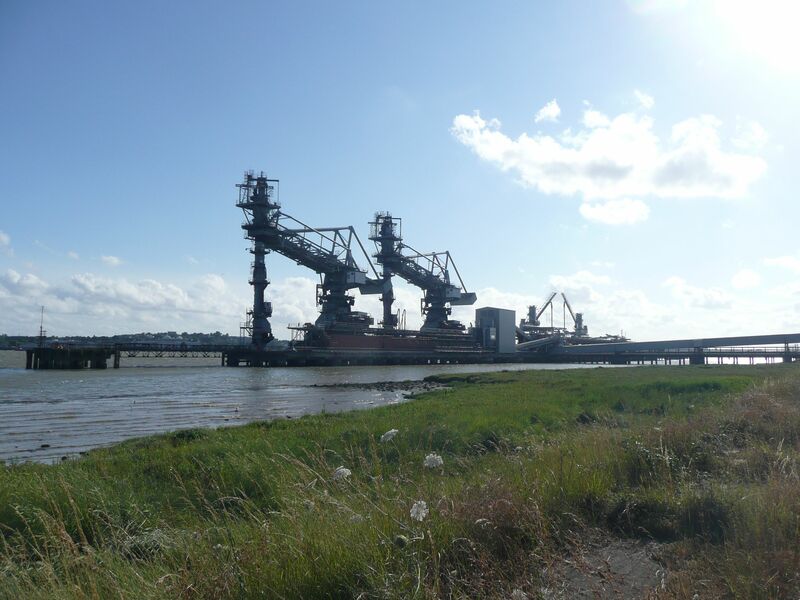 The powerful silhouettes of dockland machinery rise up out of the river as I approach Tilbury Fort, their inhumanity reducing me to the status of some lowly creature creeping along the riverbank. 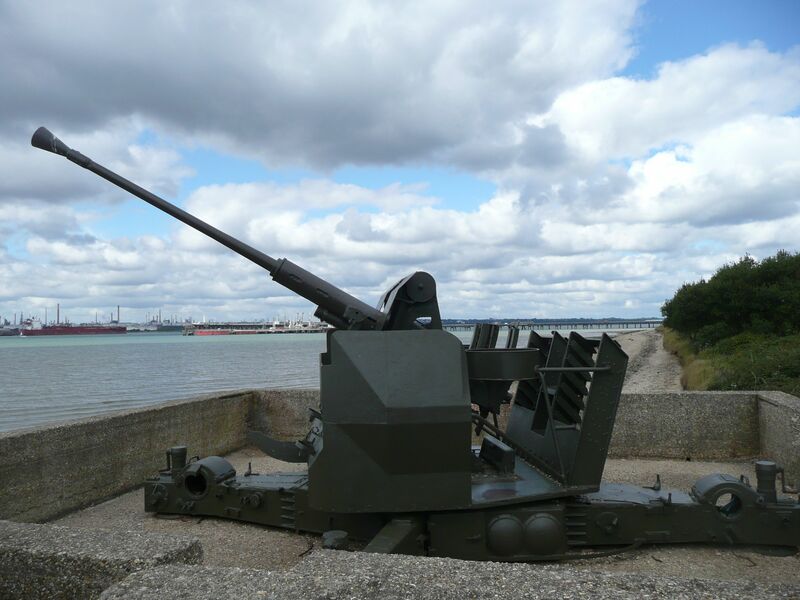 At last I see the guns of Tilbury Fort and a gate which I assume means the end of the sea wall. Looking down the bank to the right I see another path that looks as if it will take me past the back of the fort so, wondering only a little about the security sign, I head confidently down the path, round the fort, only to come to a dead end – a locked gate with very dangerous looking spikes on top of it. Sighing I turn around and walk back to take a look at the first gate which had stopped me in my tracks. Lo and behold the first gate is easy to deal with so I am now back on the sea wall again, resolutely walking past the World’s End where I could have gone for a pint if I wasn’t in such a hurry to get the ferry. 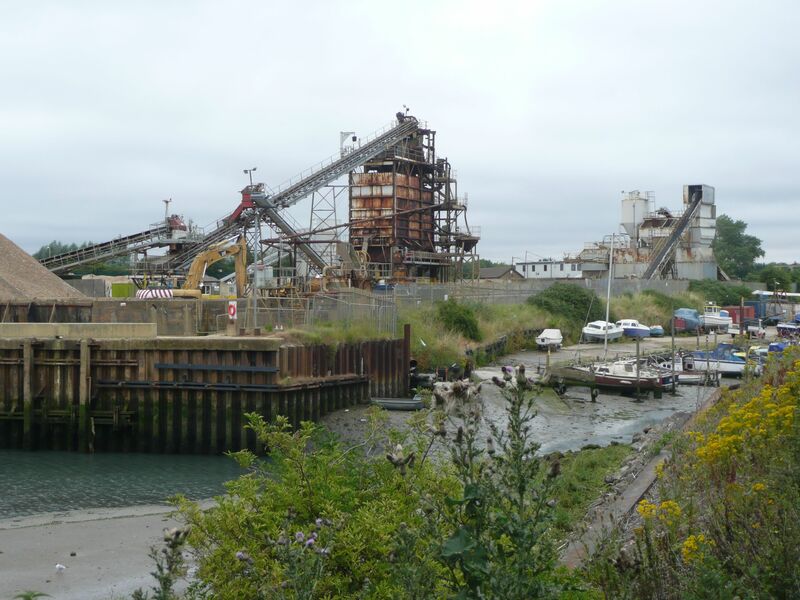 And there she is – the ramshackle Duchess to rock me over to Gravesend and a train back to London. This has been a very enjoyable walk – all the more for my initial doubts. It takes me 10 minutes to find my way out of Bosham as the tide is high and the houses and sailing clubs have monopolised the seafront. 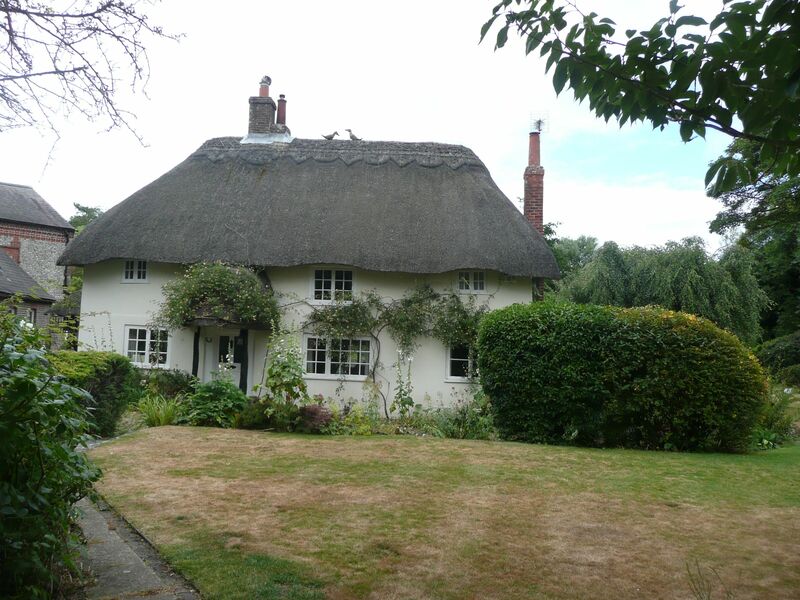 I walk through the churchyard 3 times before settling on a plan, but in the meantime I catch sight of a beautiful house. It looks very like the one I embroidered as an 8 year old which is now hanging in our kitchen. 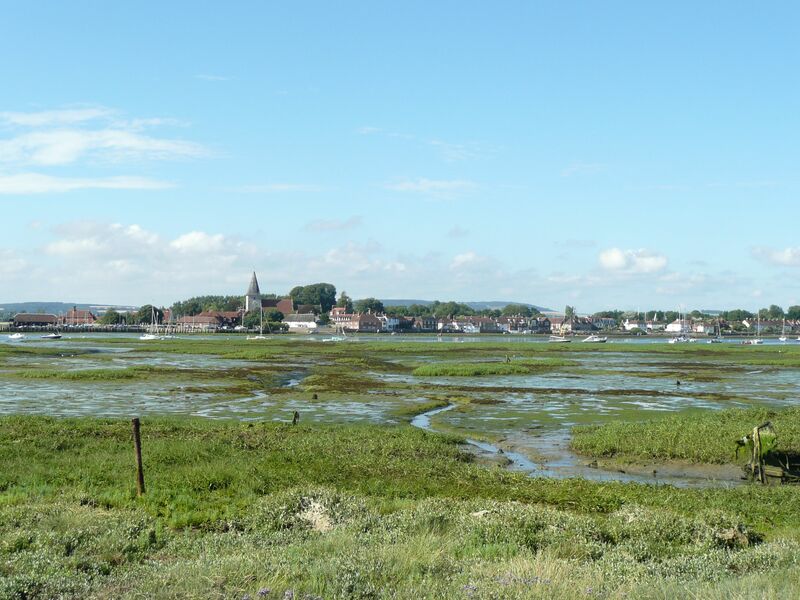 After navigating my way through the back streets of Bosham the path takes me across fields, over a road and on to a narrow grassy path down the other side of Bosham Channel – there are lots of nettles and I am wearing shorts! The path soon stops so I take the tarmac road towards Chidham. Just before the village, a path leads off to the left through a small PRIVATE estate of manicured houses, signs everywhere instructing walkers to keep to the path. 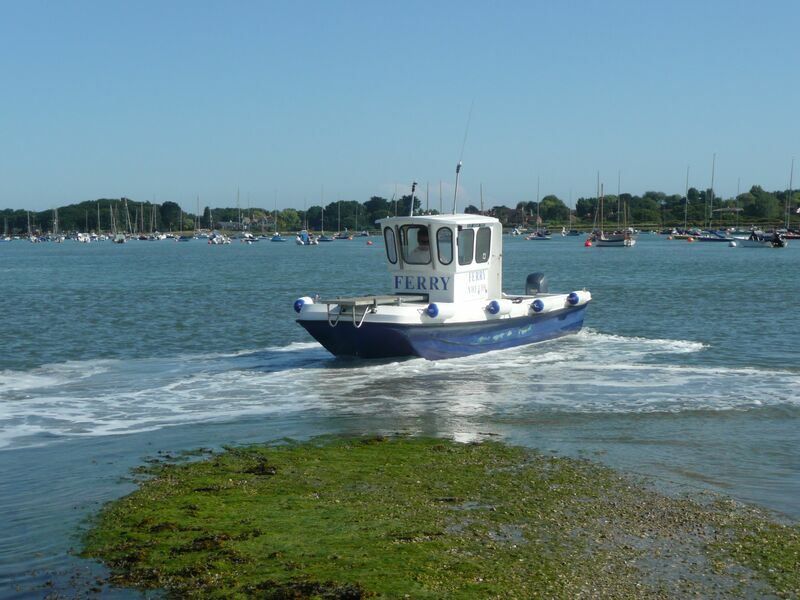 I am heading for the tip of the peninsula known as Cobnor Point but after being directed away from the water to avoid walking through a youth activity centre, I am then herded into another diversion. New fences have been erected to guide walkers down a temporary path which passes a busy site where diggers chew into the earth. 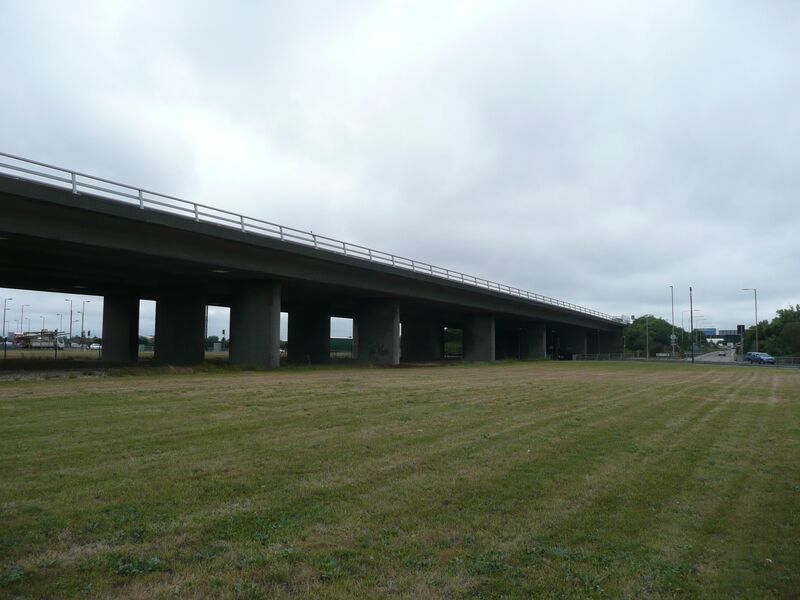 A sign informs me that two breaches with bridges are planned, to protect the intertidal habitat affected by climate change – I now feel a little ashamed of my initial irritation. Rounding a corner I come to what I think must be the point of the peninsula. It is a beautiful spot overlooking the expanse of bright blue water. 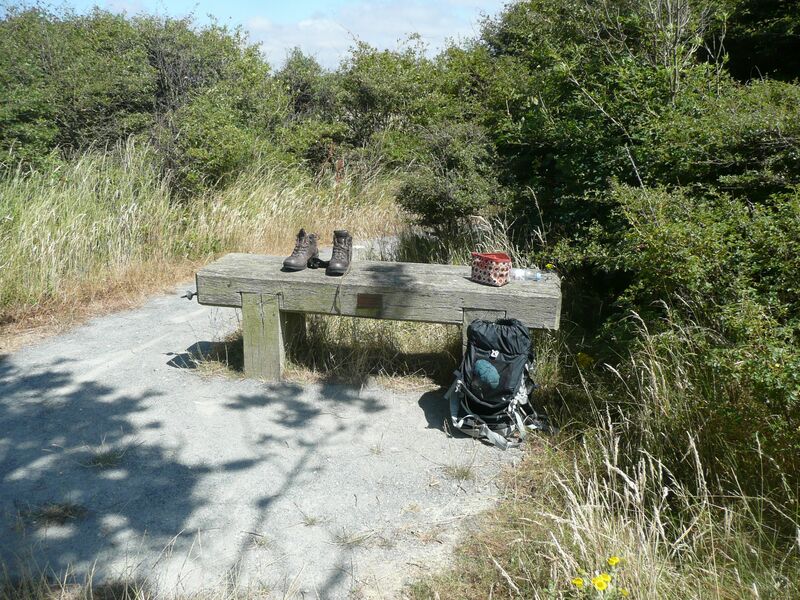 A knot of trees shaped by the prevailing wind provides the backdrop to a few quiet moments on a bench, a perfect spot to let thoughts go……………………….and to take heavy boots off and feel the warm grass between your toes. It is so peaceful. However, little do I know that every moment I spend luxuriating in the sun, the sea is creeping another few inches up the shore. I put on my boots to follow the footpath sign and then realise I will have to turn back. The path in front of me will soon be covered in water – the tide is coming in fast and there is no way I can walk higher up. Reluctantly I head back through the sheep runs, trespassing on the grounds of Cobnor Farm to come out onto a PRIVATE tarmac road that leads down to Chidham. I now have a blister so I head for the pub marked on the map to get myself something to drink and search out the plasters. 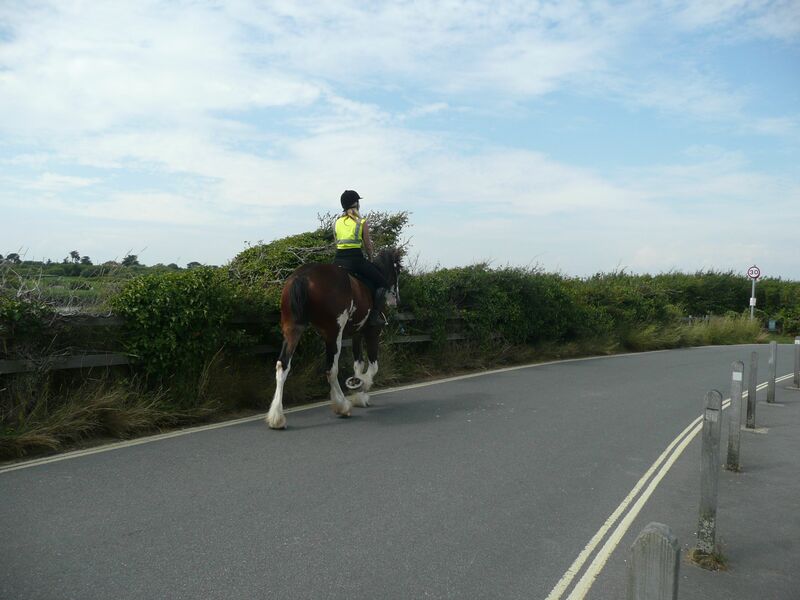 From there on it’s a short walk on the road until I veer off left onto a path which takes me back to the sea wall. 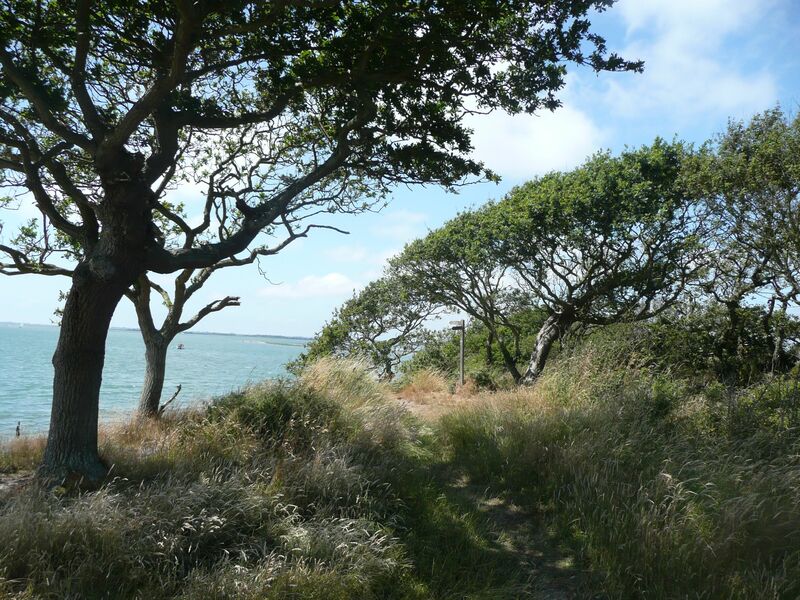 This part of the walk is easy – a good path on a raised bank beside the water, a very welcome sea breeze and long views. Stopping to talk to a cheery gentleman with five beautiful golden retrievers I am suddenly witness to a close encounter with a wind surfer. Losing control of his craft he falls into the water very close to where we are standing and although I don’t want to stare, I am fascinated by his many attempts to get back up on the board again. After a great deal of heaving on the sail and sloshing about in the water he eventually gets himself to an upright position and the wind whisks him away. Arriving at Prinsted I decide not to walk around Thorney Island (no islands or anything that calls itself an island) and after wandering around in someone’s front garden looking for the footpath sign I head off to cross to the opposite side of the island. Coming out of a wood I am confronted with the strange sight of what look like rows of white containers on black wooden stilts. 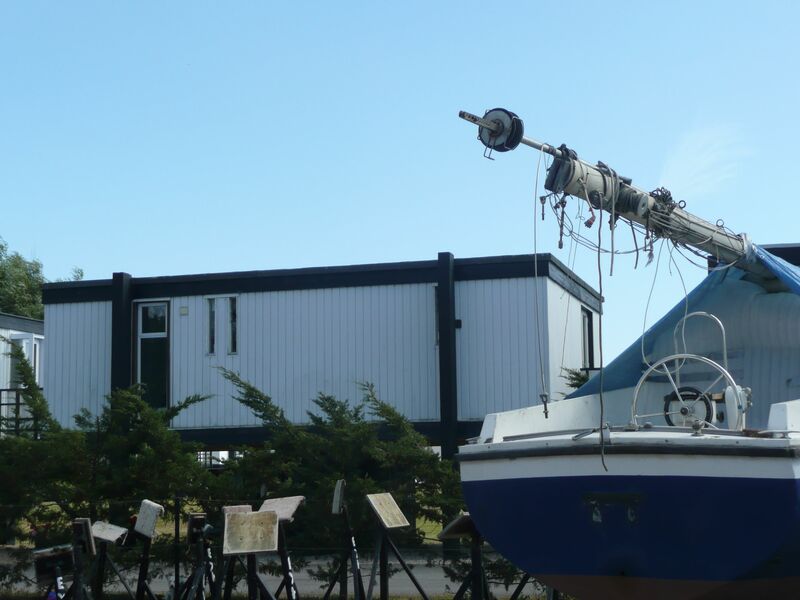 These are the Emsworth Deckhouses presumably for the owners of the boats in Emsworth Marina – small boats, canoes and any other sailing paraphernalia can be stored underneath the houses. 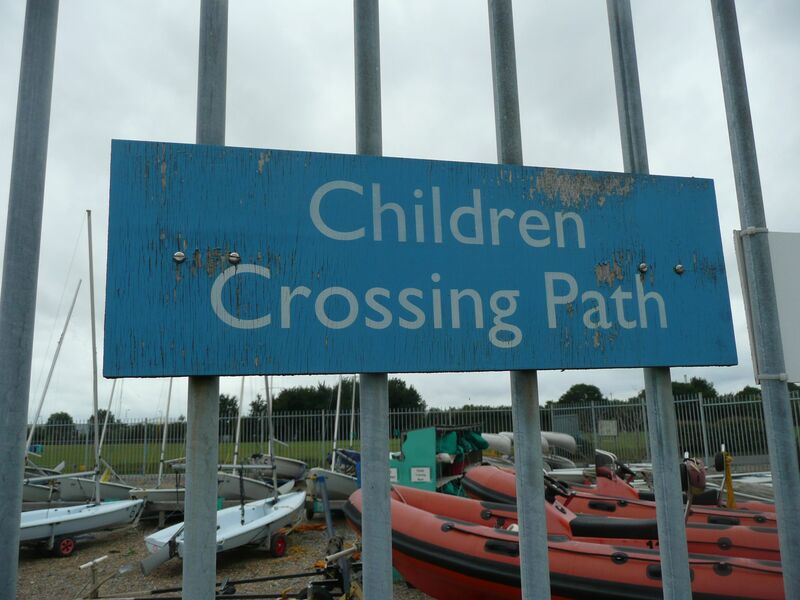 The signs in the boatyard are very confusing, I ask for directions but have to keep checking that I’m still on a right of way – I am battle scarred from a day of private estates. 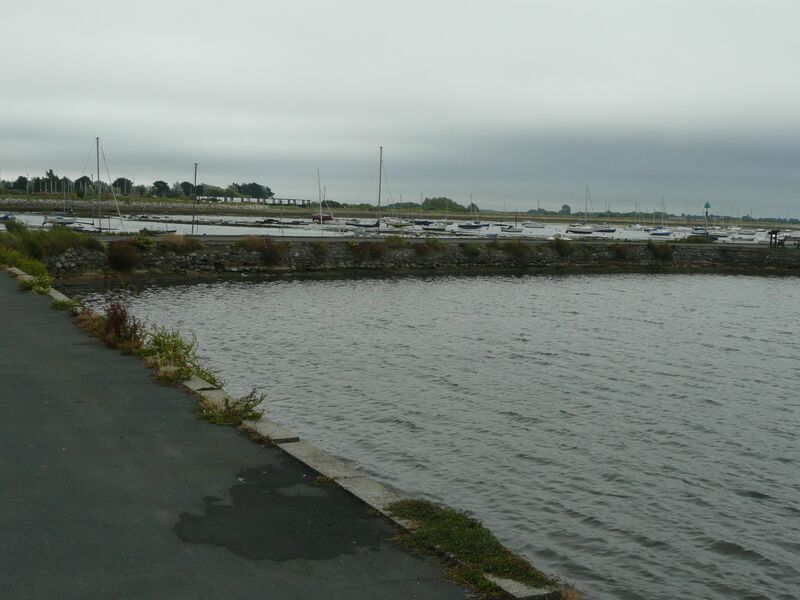 Eventually I come out to the “pond” – a narrow path crosses it which leads out to the centre of Emsworth. It’s only 4pm but I need somewhere to lie down so I head for my B&B. 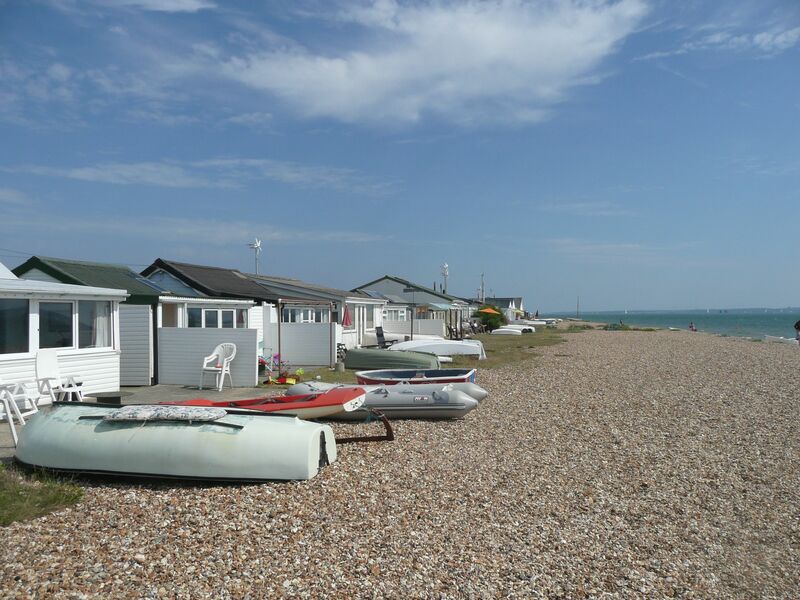 The taxi driver that takes me back to the shoreline is a recently retired gentleman from Maidstone who “has never looked back” and loves Selsey and its people. He has also cycled the beach from Selsey to Bracklesham, only dismounting a few times, so I feel a little better about tackling 4 miles of shingle with the tide coming in. 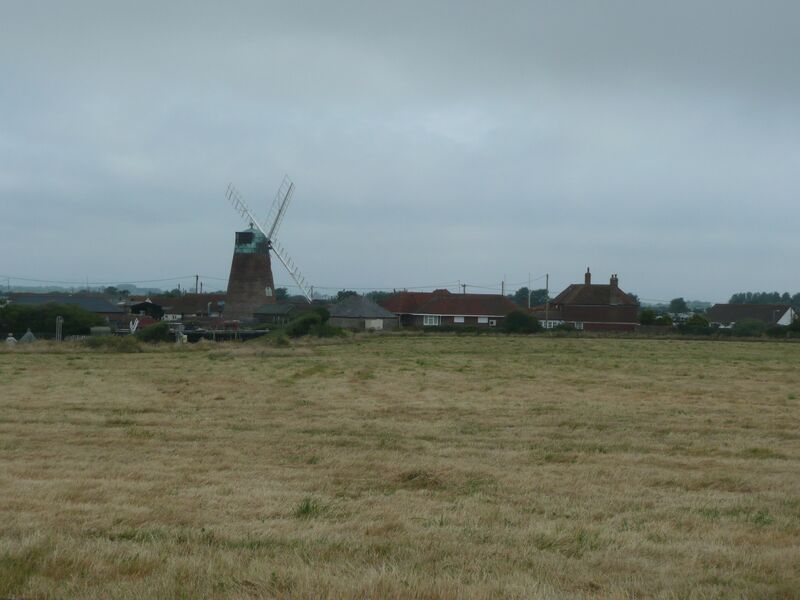 With the windmill as a landmark I set off down a narrow grassy path which then leads me through a newly built leisure centre and a little later a sign that I choose to ignore. 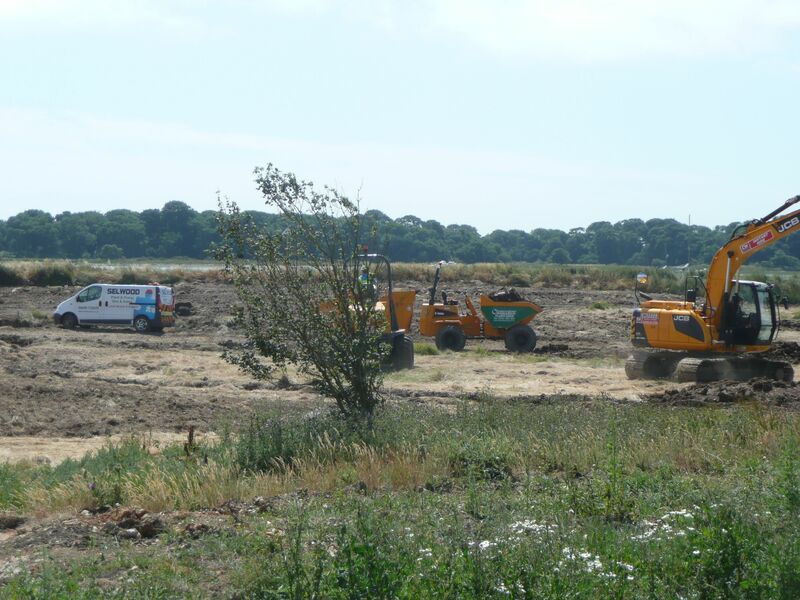 I can see the outline of big diggers and trucks in the distance but all is quiet and there’s plenty of space for me to walk on semi-firm sand close to the water. Huge piles of rough grey boulders have been deposited at regular intervals to act as breakwaters – I recall the taxi driver telling me they have been brought from Norway. Walking on the sand is easy and when I’m forced higher up the beach by the tide I discover a service road that I can walk on, away from the dreaded shingle. In the distance I see a couple of men in hard hats and high viz vests and have a moment of worry about whether they are going to tell me to go back but they seem totally disinterested in me. 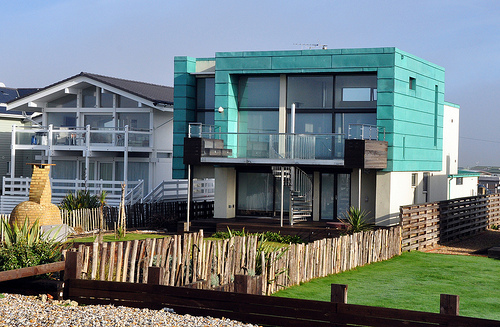 The beach houses of Bracklesham are soon visible, some of them adding a touch of modernism and bohemia to the traditional bungalows. This one catches my eye…….the sea right behind it.By now the sun is really hot and I’m starting to feel a little faint – perhaps I need sugar? Or salt? I come away from the shops of East Wittering with a packet of peanuts and some dates. 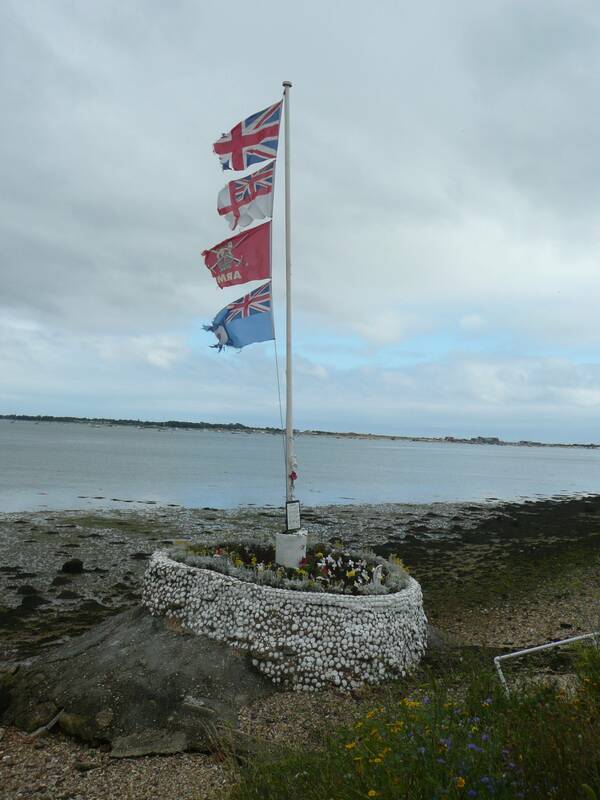 The next part of the walk to West Wittering is an interesting picture of social class. Blocks of retirement flats and sixties bungalows gradually give way to more interesting wooden houses and modern flats. 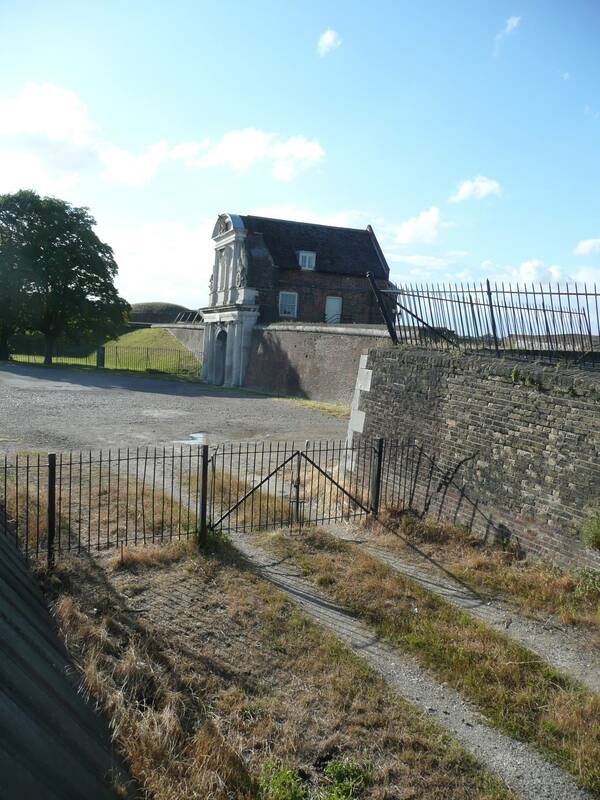 The houses get bigger and grander until the concrete path turns into a wide grassy track with sand dunes and the sparkling sea on the left and a line of almost impenetrable hedge on the right, the defence only broken by elegant entrances to these coastal palaces. Leaving the path I join the crowds down on the beach, feeling a little conspicuous in my leather walking boots and rucksack amongst the colourful beachwear and suntanned bodies. 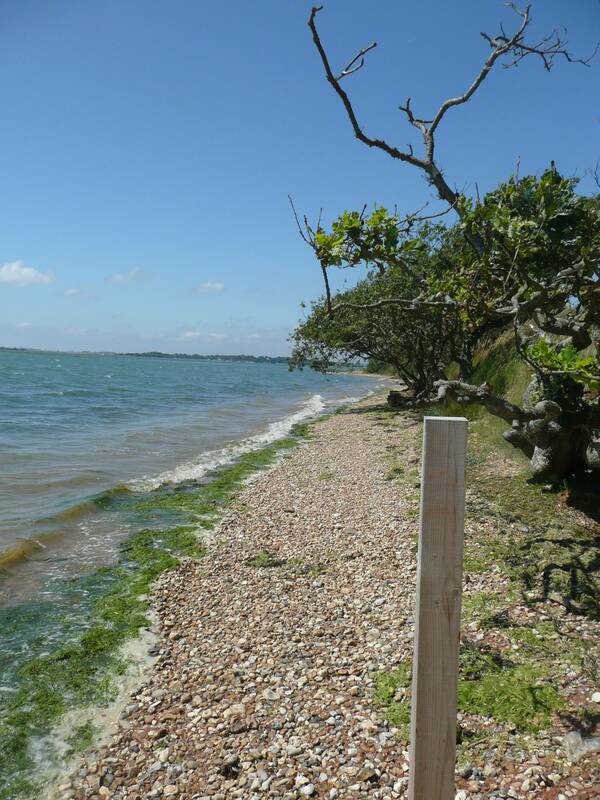 My feet are now craving cold water but I need to find the path that will take me up the Chichester Channel to West Itchenor and the ferry to Bosham. Wandering worriedly around the immense car park behind the dunes I see a tap for people to wash sand off their feet. Oh the joy of cold water on hot, throbbing feet! I decide to stop for a cup of tea at the beach cafe. 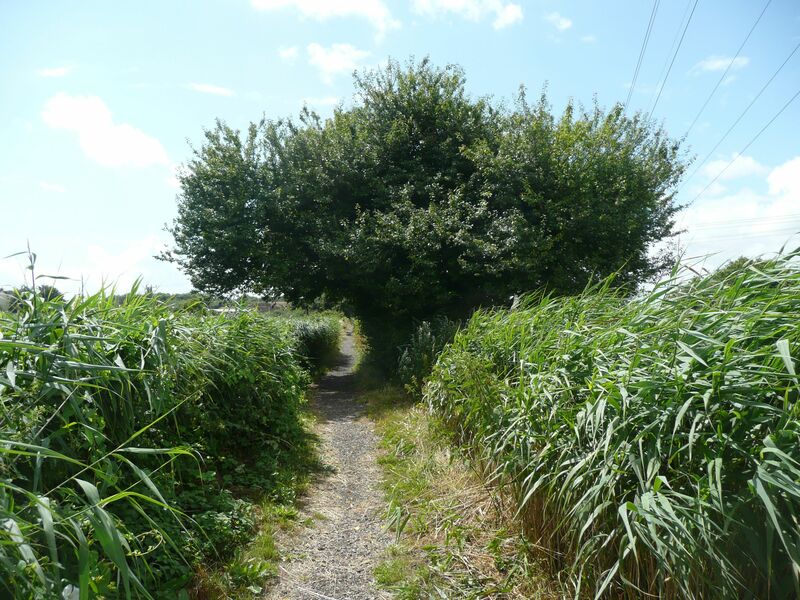 As I drink my tea I see a few groups of people heading off to my right on what looks like a path heading into the marshes – this is my path. 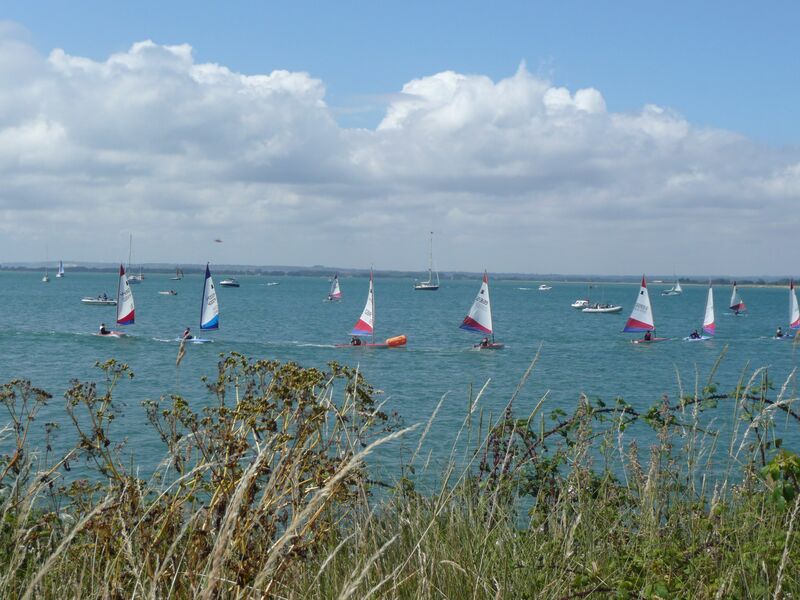 Soon I am striding confidently up the side of the estuary, entranced by the colours of the hundreds of small sailing boats out to play. I pass a couple of children playing in the water on a lilo, not far away from a sign warning of strong currents. I ask them to be careful but they just stare at me and don’t answer. Of course I realise the question is more for my benefit than theirs but I can’t help asking just the same. 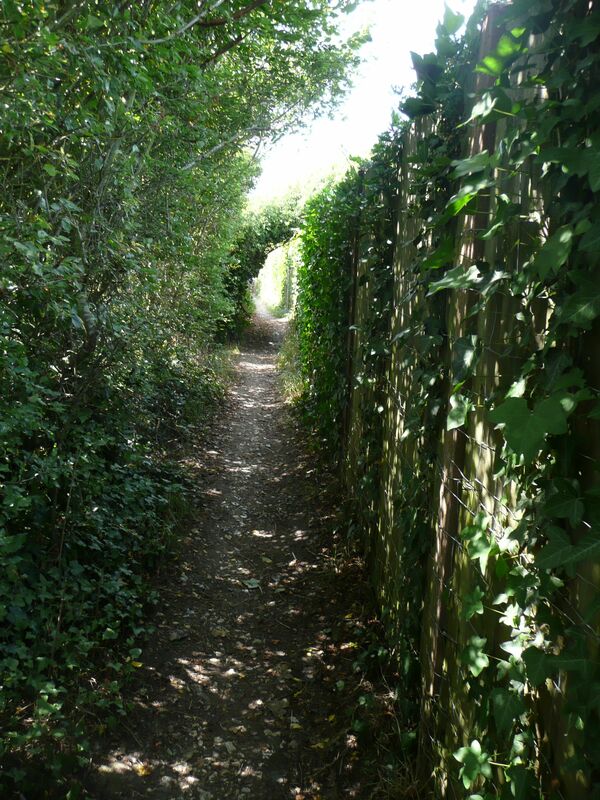 The path from now on is clear and well signposted, I am sometimes exposed to the searing heat of the sun and at other times led into cool shady lanes. 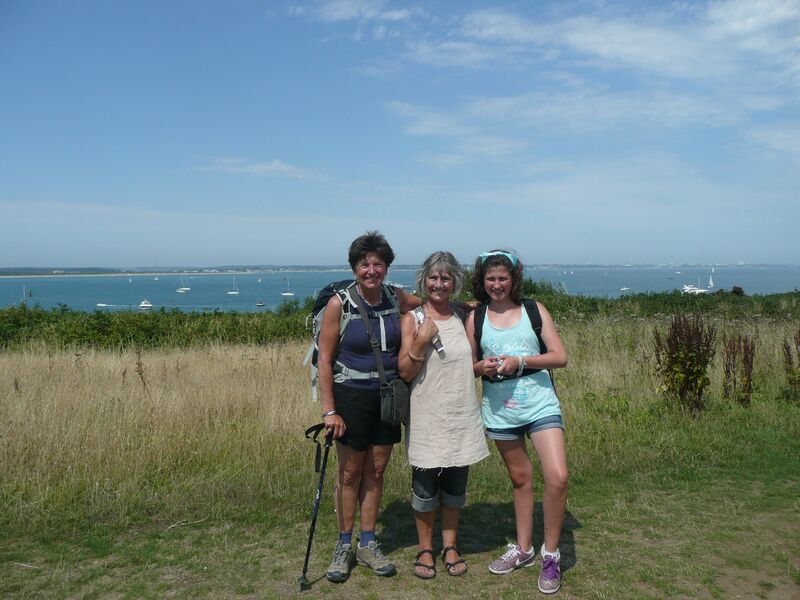 Although this part of the walk is lovely I am now very tired and extremely relieved to see the the boats in the harbour at Itchenor (or Itchner as the locals call it) – I celebrate with an ice-cream and wait for the ferry. As I wait I get talking to a man in a sailing cap with the most weatherbeaten face I have ever seen. 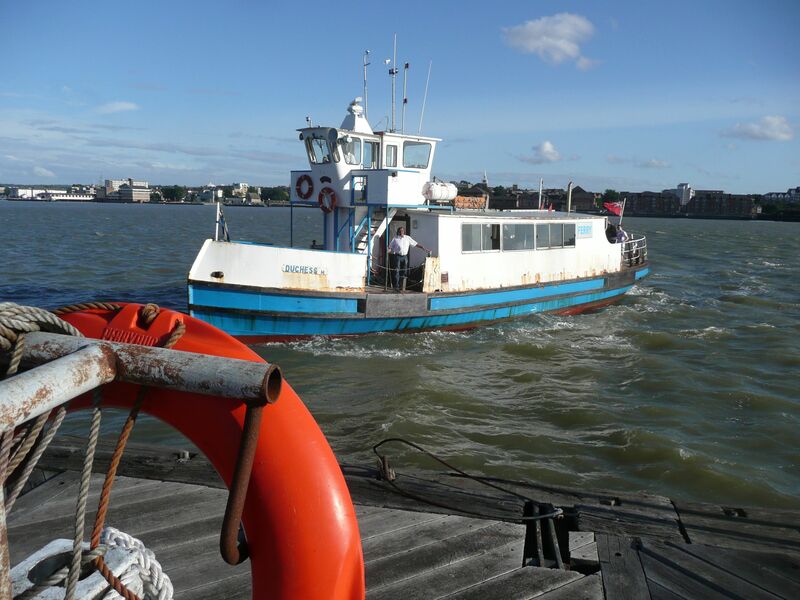 He is the captain of the harbour trip boat moored in the same place as the ferry. Catching sight of movement under his boat he tells me the fish I can see are sea bass – I am surprised to see them so close to the harbour. Five minutes later the little ferry arrives, stacked high with bicycles and people. 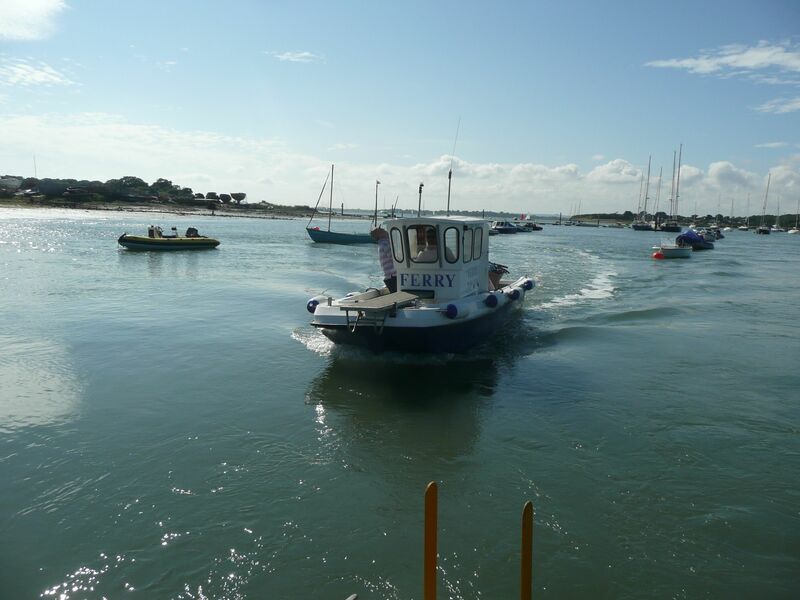 I am taken aback by the speed of the crossing and even more when it appears we get off onto a damp concrete causeway quite a way away from the shore. 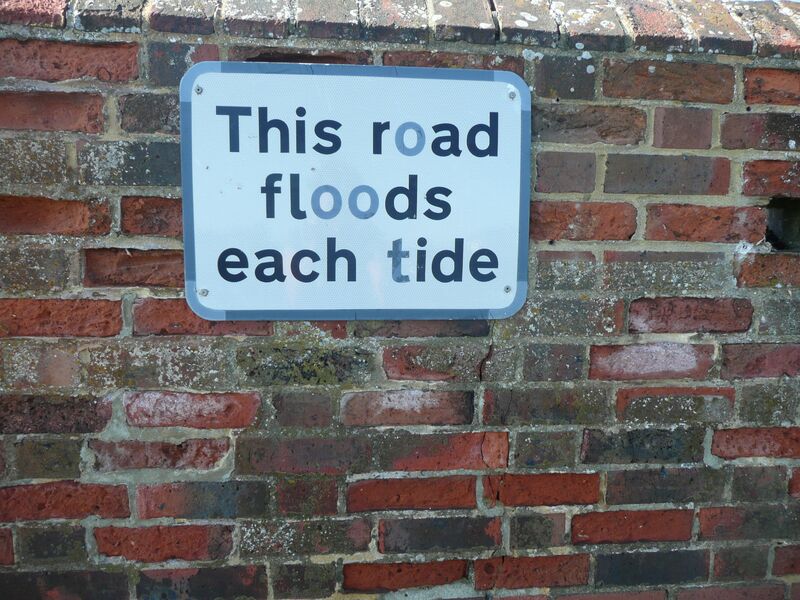 I am assuming that this can only be done at low tide. Arriving on dry land I follow the footpath up the side of Bosham Channel and soon after I spy the church spire of Bosham Parish Church. 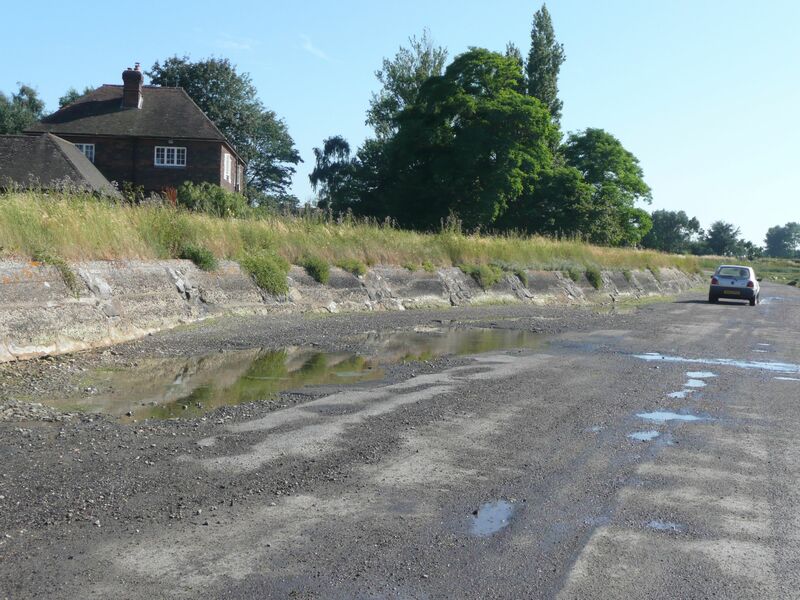 As I approach the village I notice big puddles and green algae on the road and I suddenly realise that I have been lucky enough to come this way at low tide – I would otherwise be walking through front gardens to get to the village on the other side. This is enough for today and after a pint in the pub I catch the bus to Chichester where I will be staying in a student residence at the university.